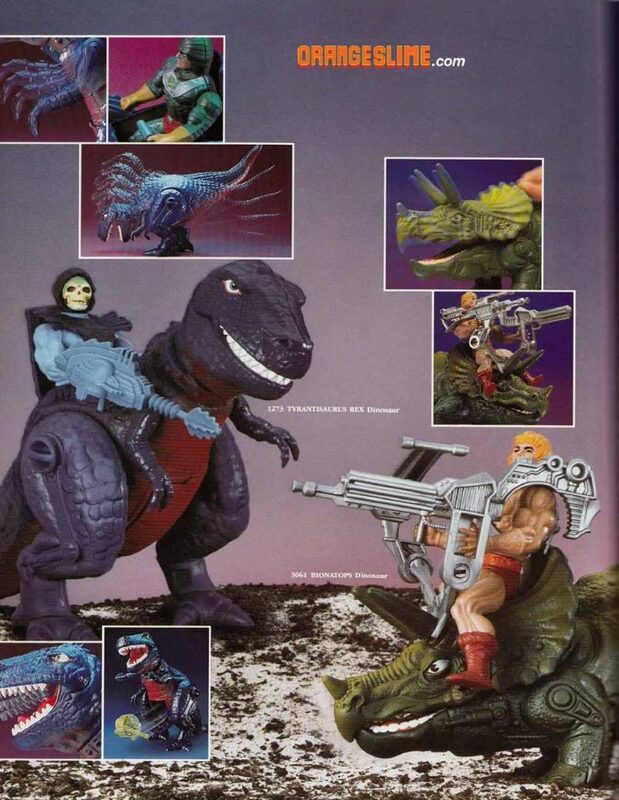 Although I missed most of the 1987 wave of Masters of the Universe figures, I did happen to catch Tyrantisaurus Rex. 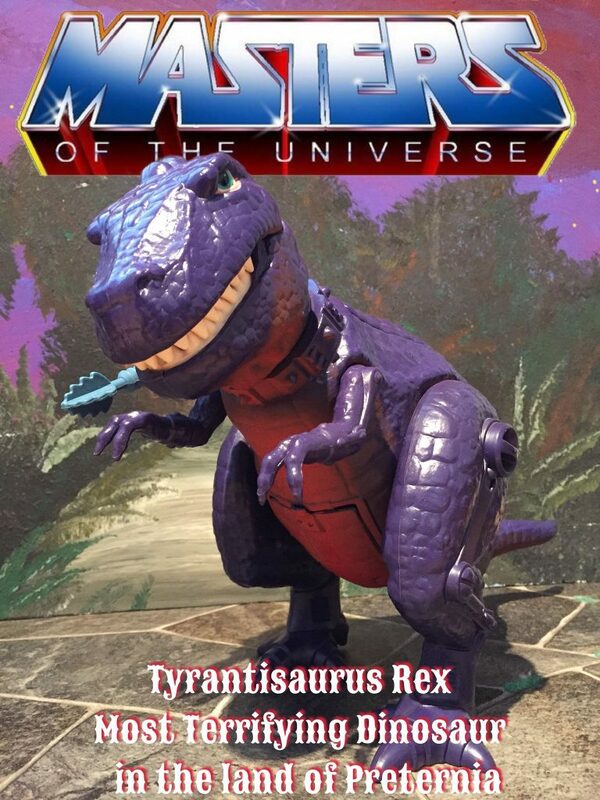 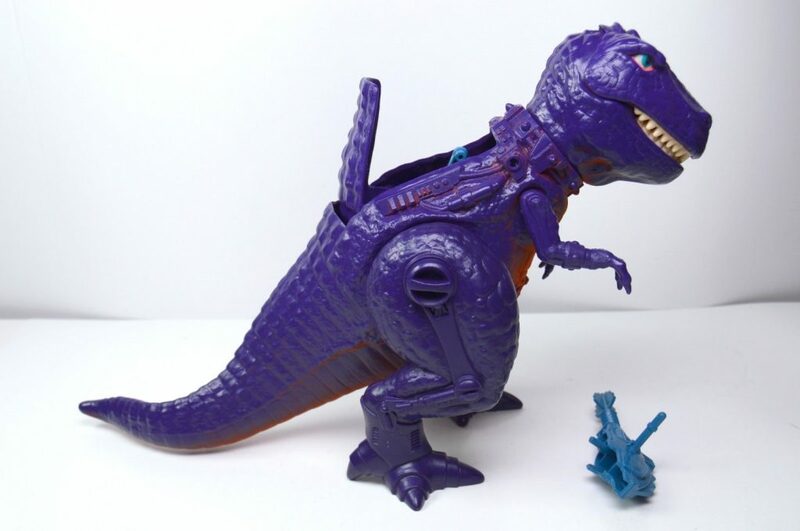 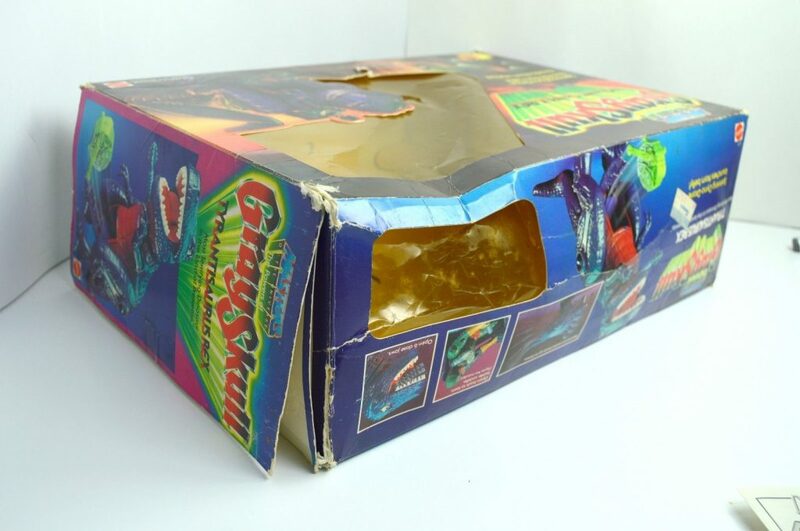 A remember being at a friend’s house, and he showed me his new purple cyborg dinosaur that could shoot a green drone from its belly. 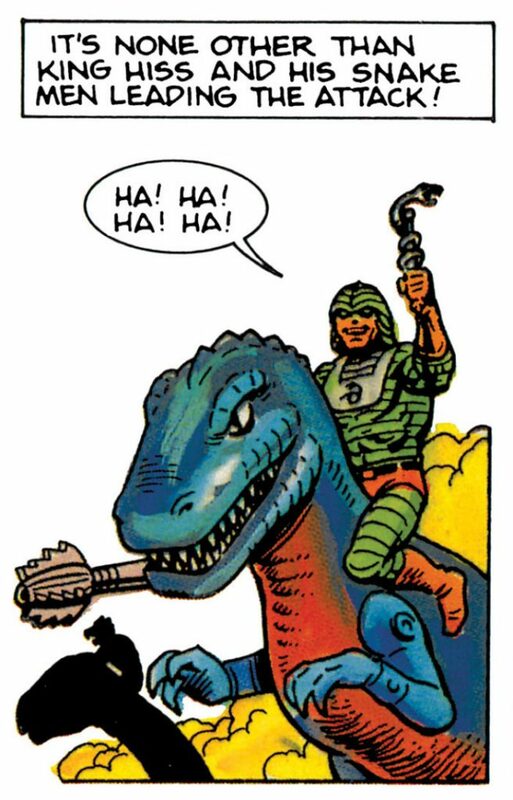 At the time I had moved on to G.I. 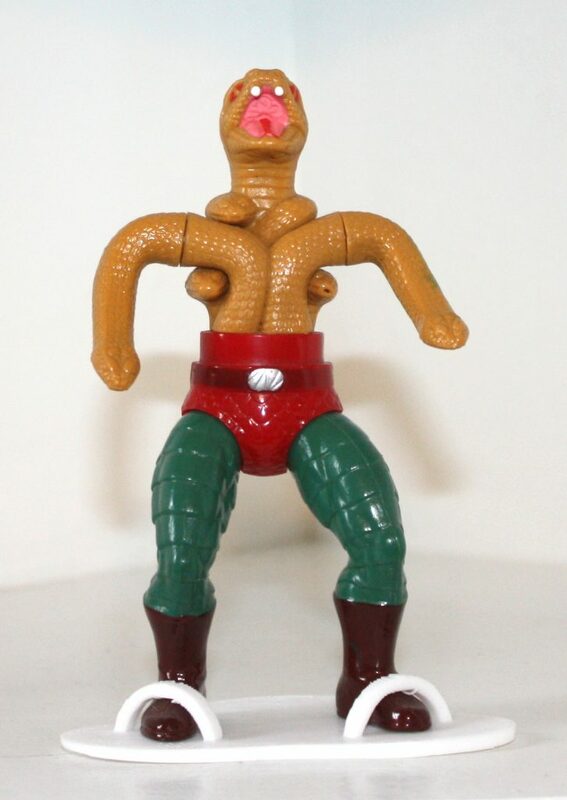 Joe, but I thought it was a pretty cool looking toy. 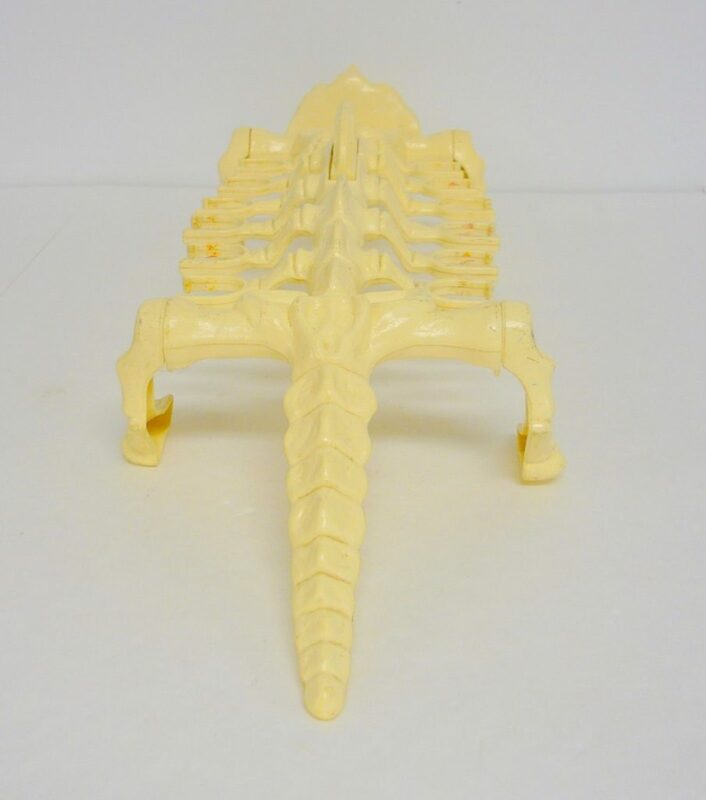 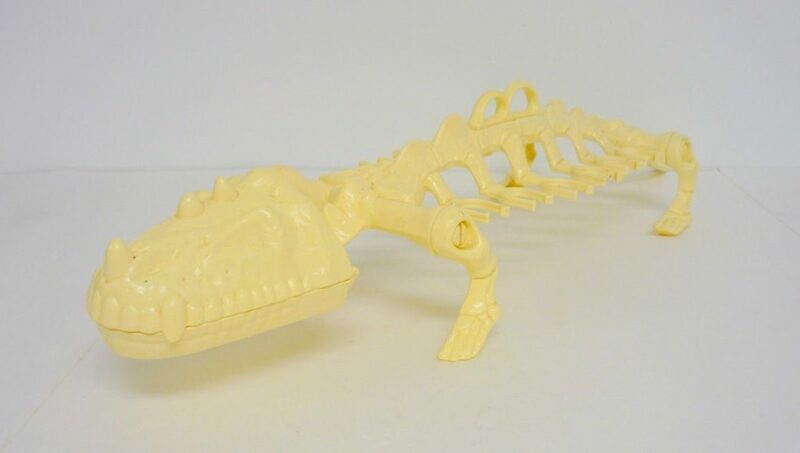 I actually happened upon the figure again, years later at a university reptile show intended for kids. 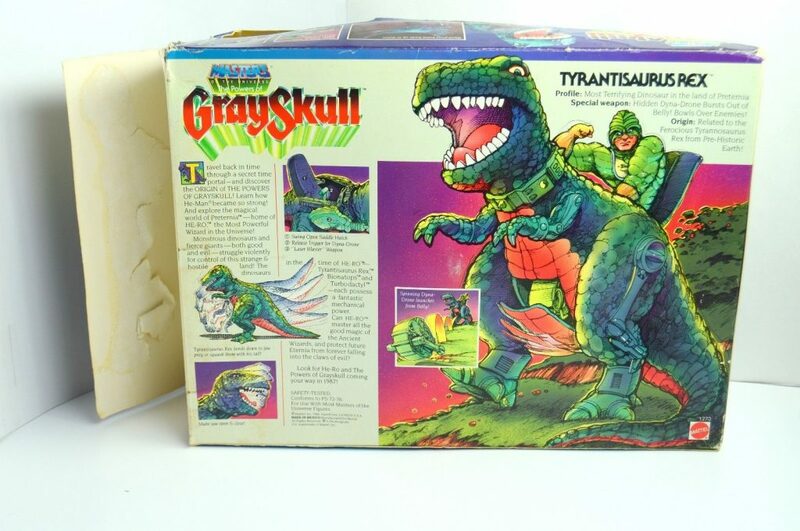 There was a table full of dinosaur toys, and there in the heap was Tyrantisaurus. 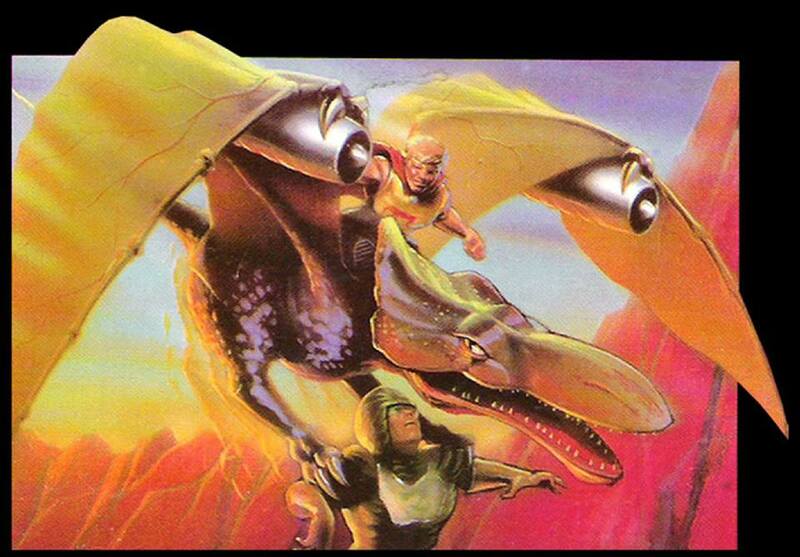 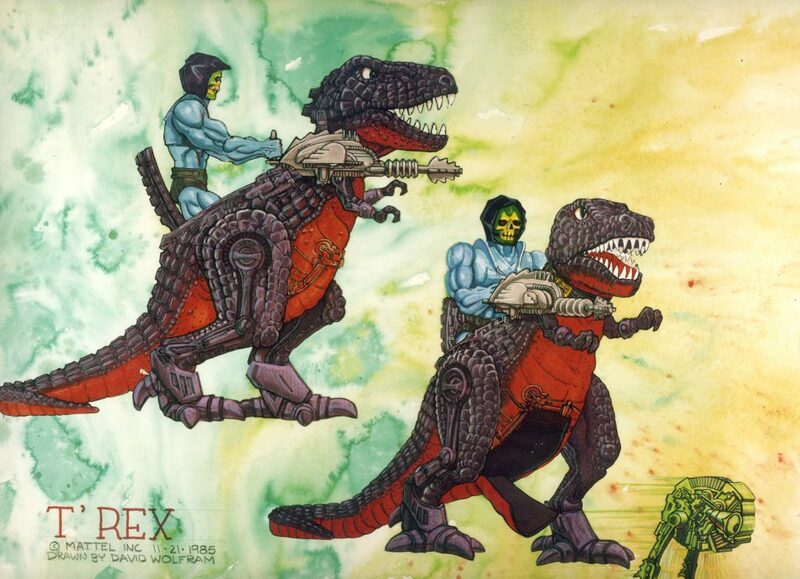 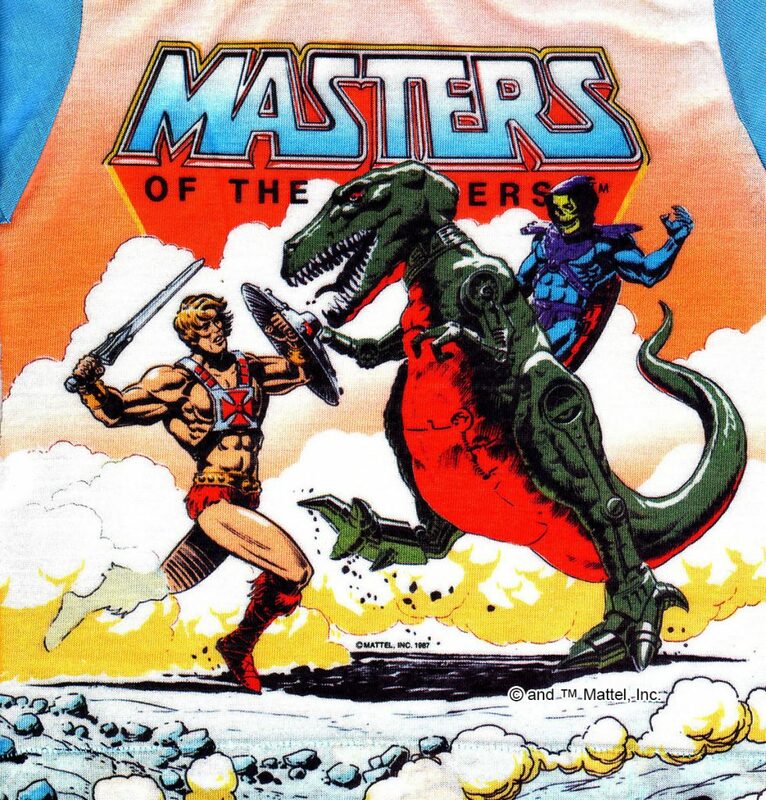 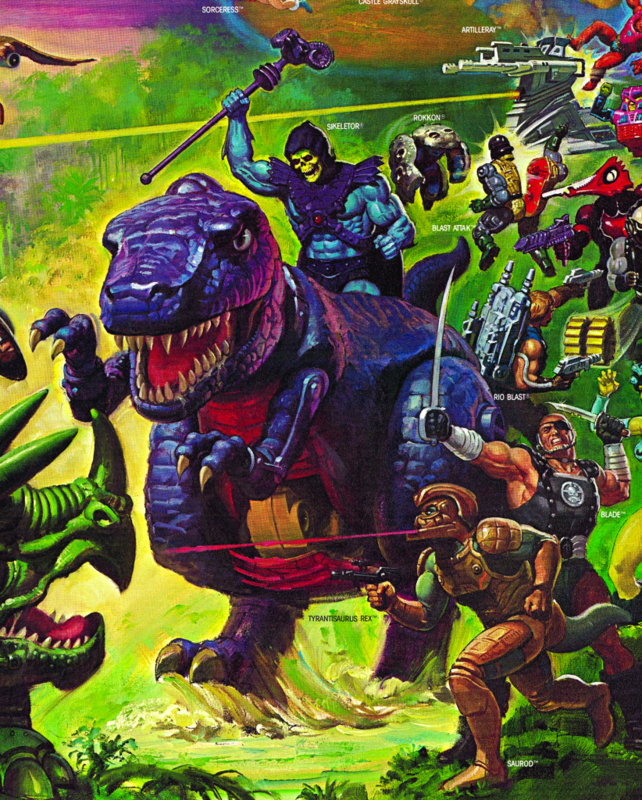 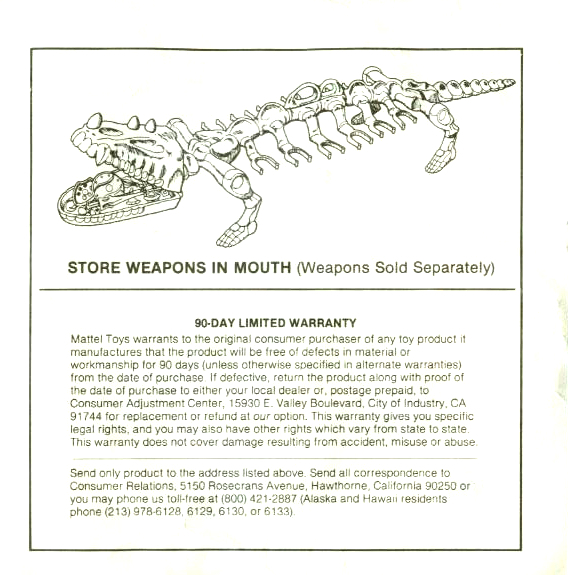 The earliest design artwork for a MOTU T-Rex comes from Alan Tyler. 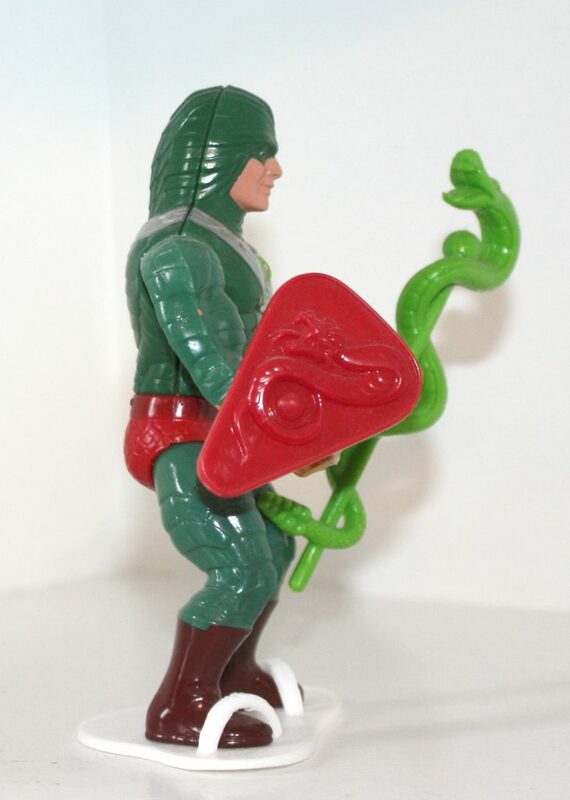 His take on the concept is quite different from what followed. 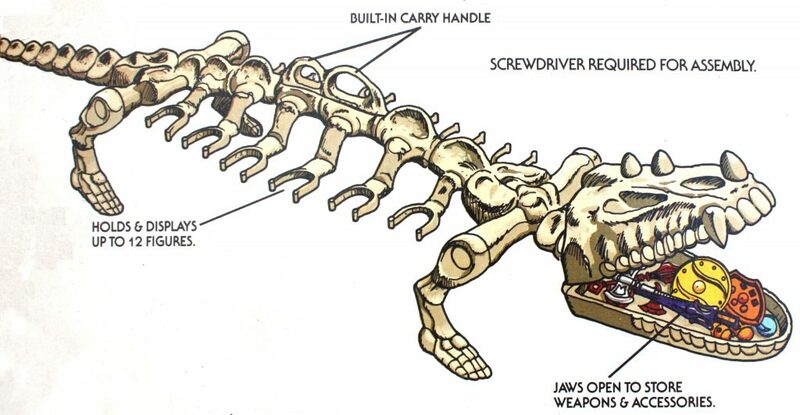 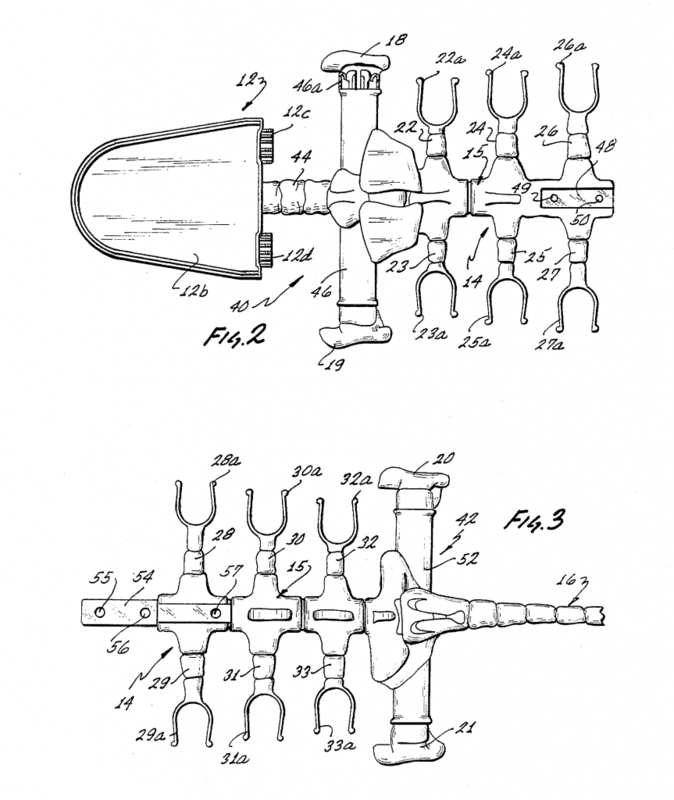 The design below doesn’t have any external cybernetic parts. 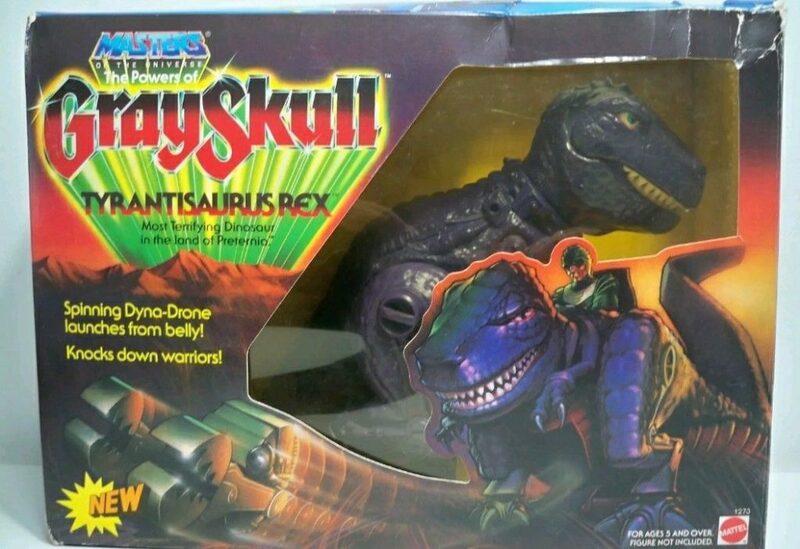 Aside from the pop out opening in the back, it looks like a fairly realistic tyrannosaurus. 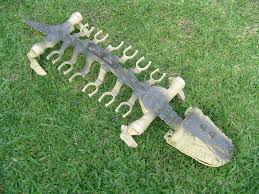 The “drone” is actually an organic creature instead of a mechanical one. 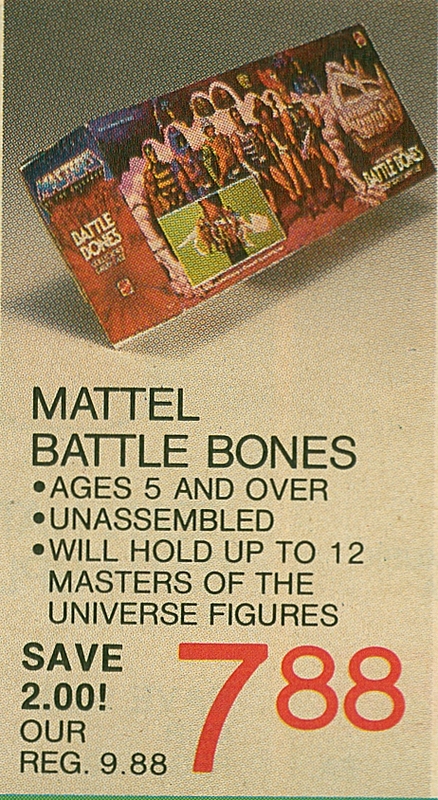 I was in my last term at Art Center College of Design, and had a fairly light schedule, so I checked into freelance opportunities offered through the job placement department at AC (I can’t remember exactly what they were called), and saw an opportunity to work on a project for Mattel. 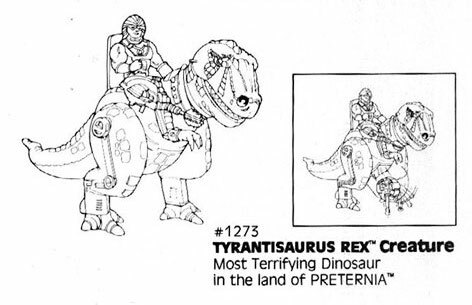 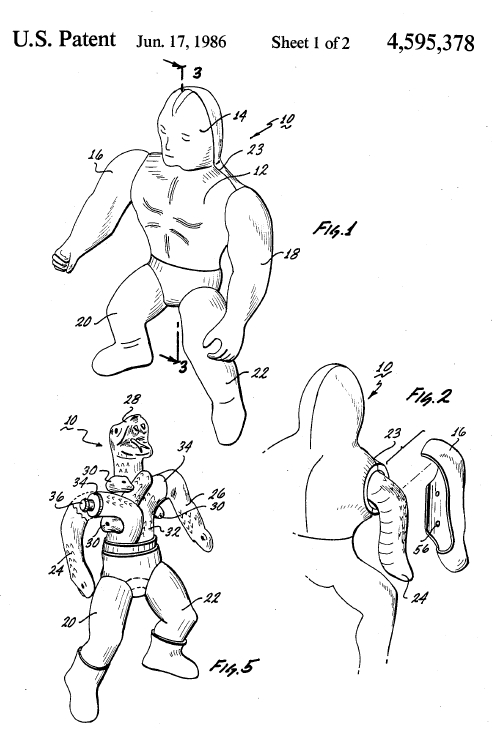 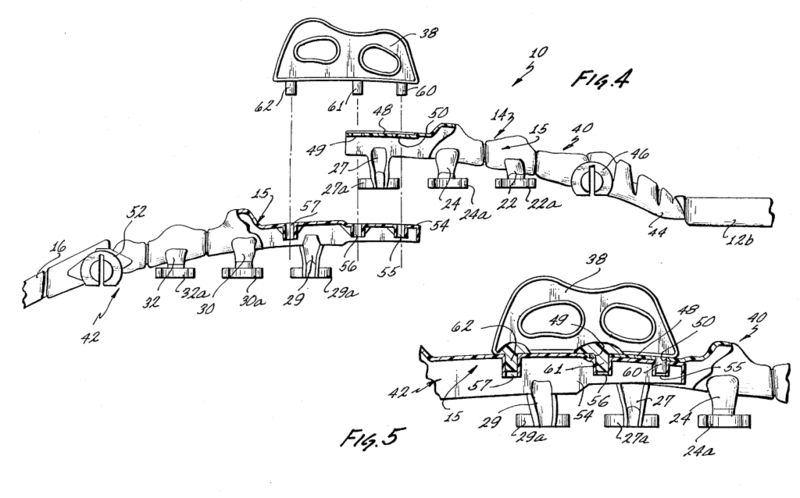 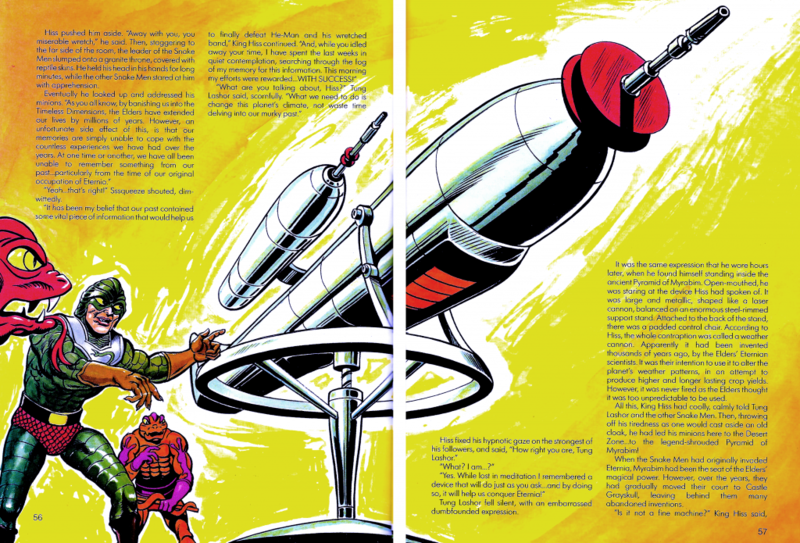 The above illustration by David Wolfram, dated November 21, 1985, is very close to the look of the actual production toy. 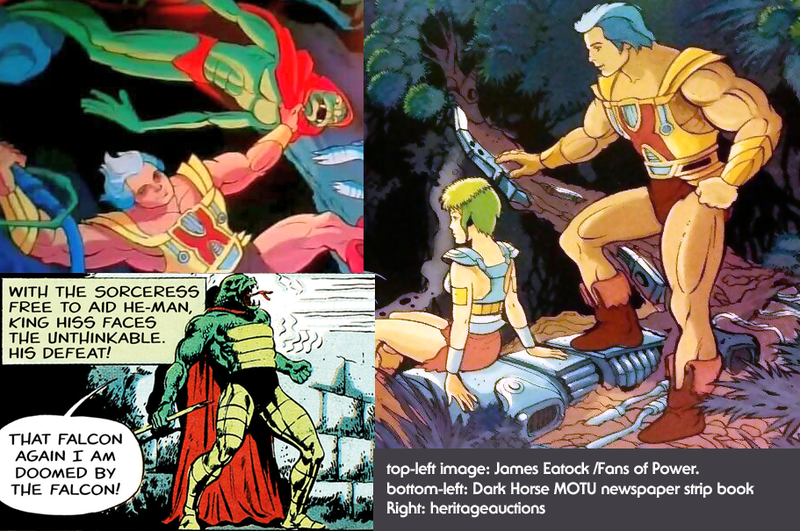 The only obvious difference is the color of the gun, which is gray in the concept art. 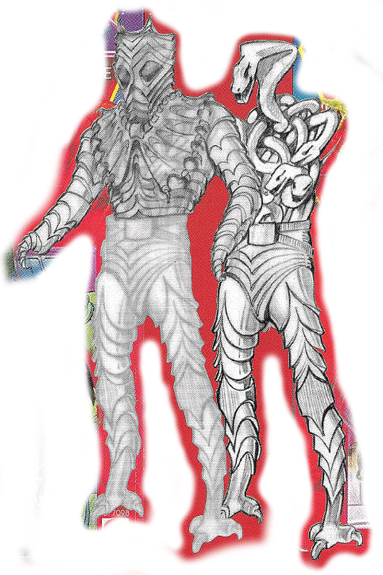 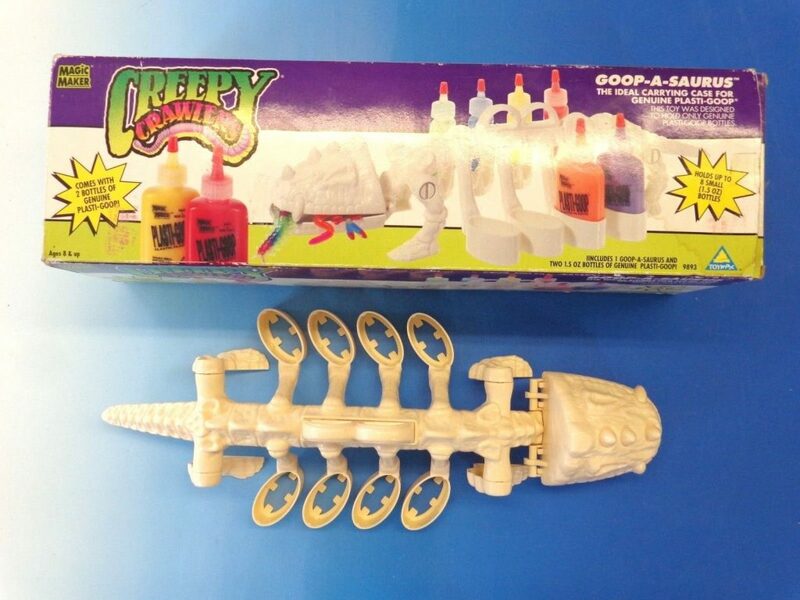 We can see the translation of the concept design into mass-produced toy below, first in the cross sell artwork (a nearly photo-realistic drawing of the figure) and in the mass produced toy below. 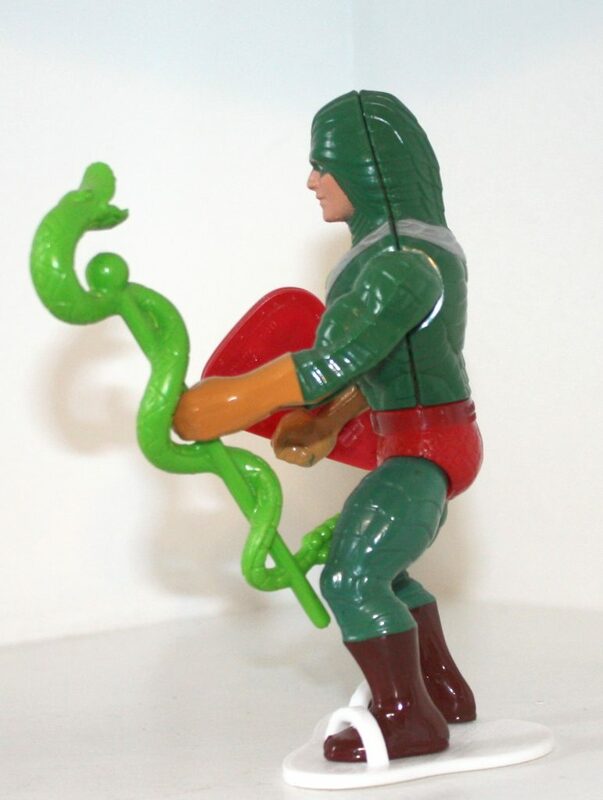 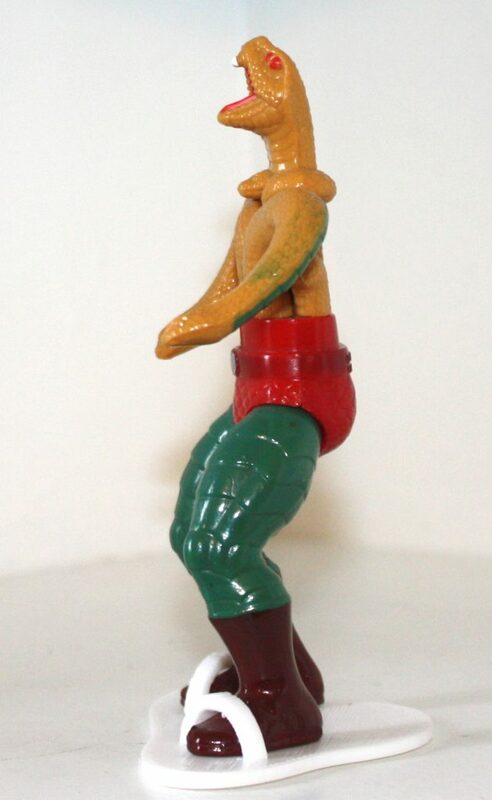 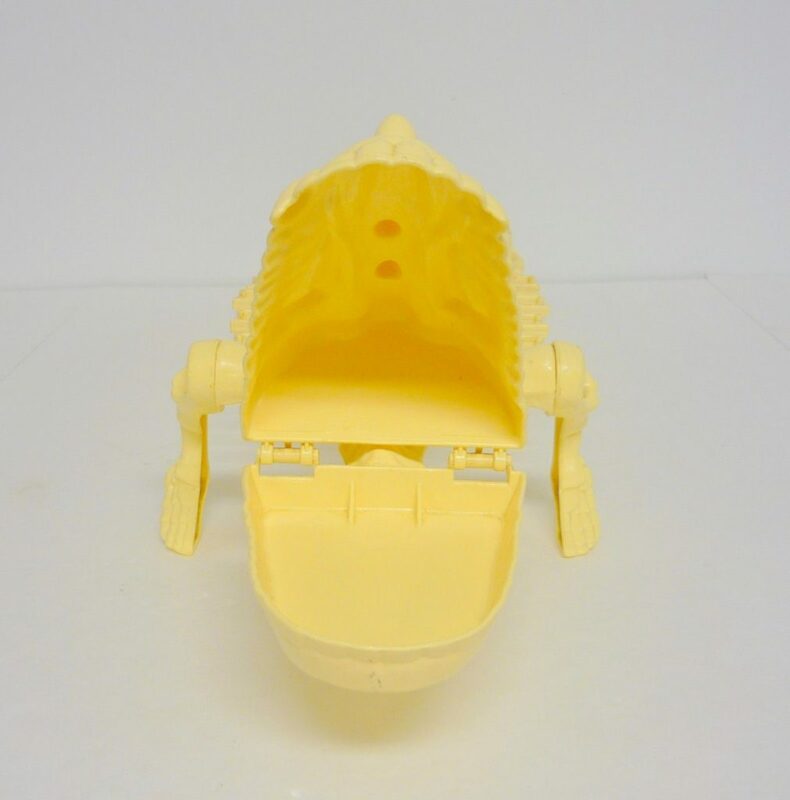 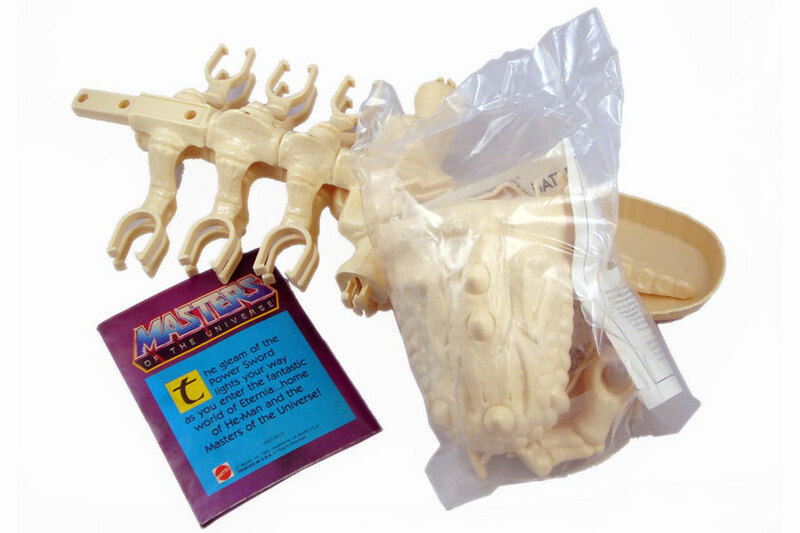 A hatch on the back of the figure opens up to allow an action figure to sit. 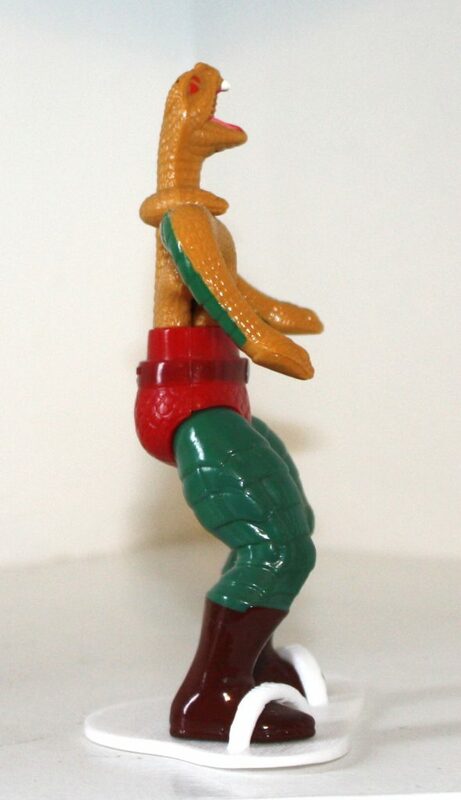 A hatch on the stomach stores the “Dyna-Drone” (a wind-up spinning toy), which can be launched from the figure’s belly. 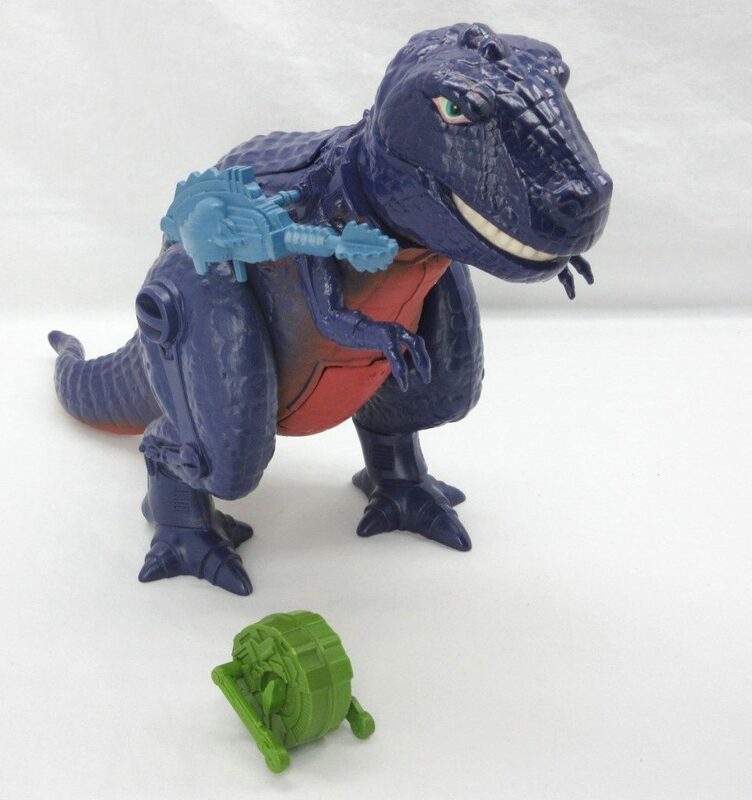 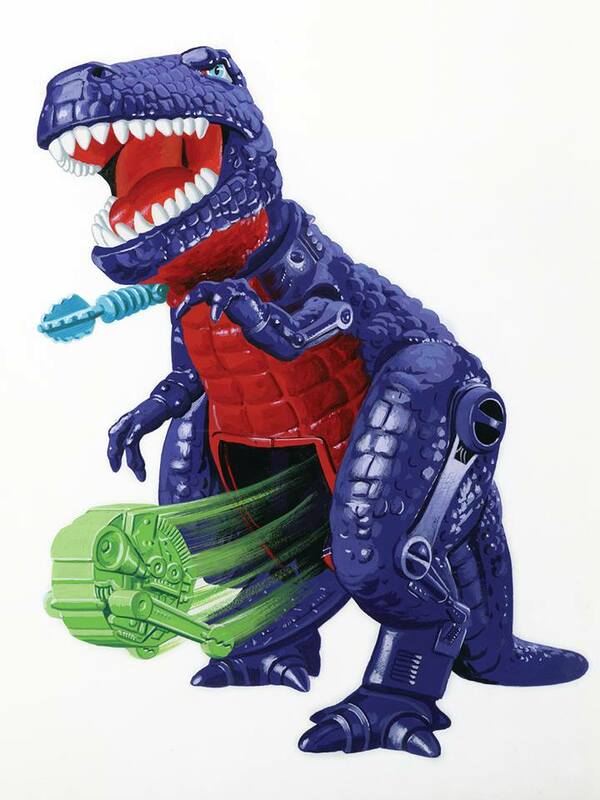 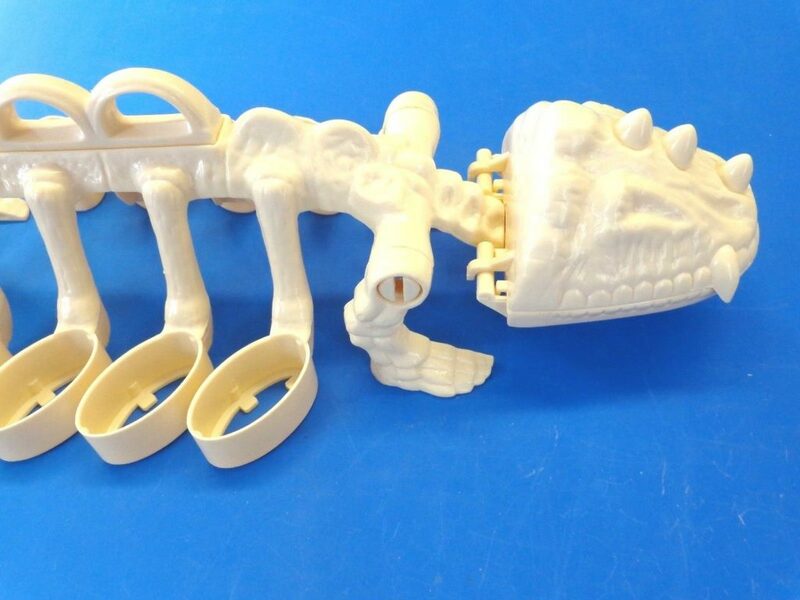 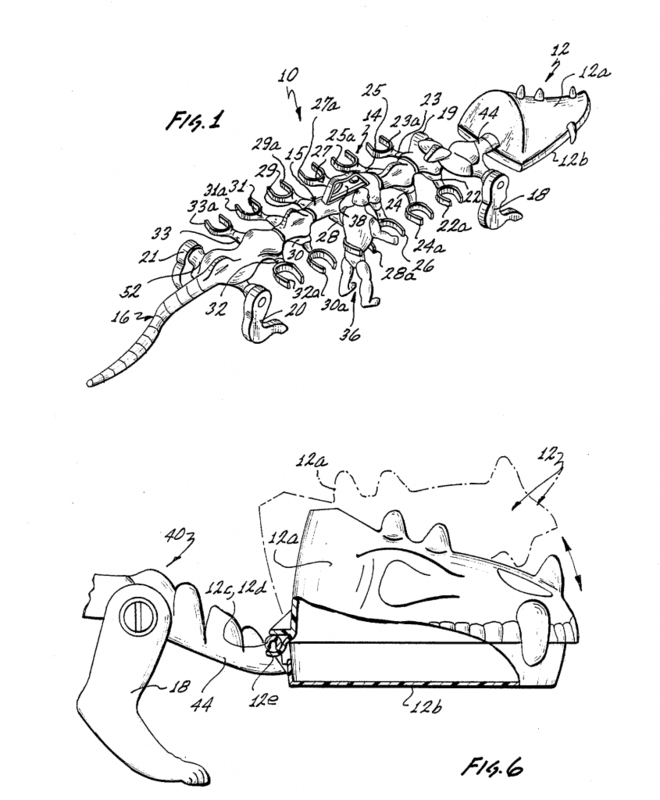 There is a removable blue gun that attaches to the dinosaur’s right shoulder, and the mouth is articulated. 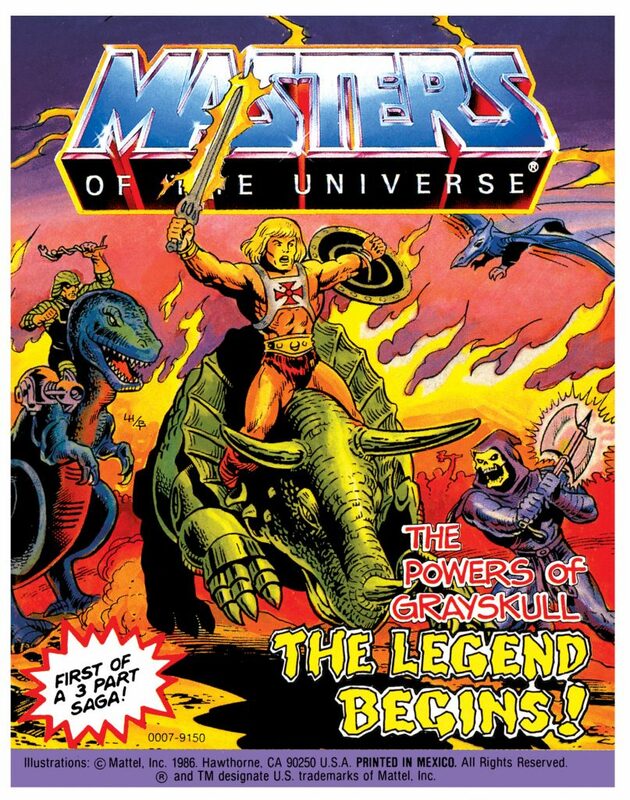 Travel back in time through a secret time portal-and discover the ORIGIN of THE POWERS OF GRAYSKULL! 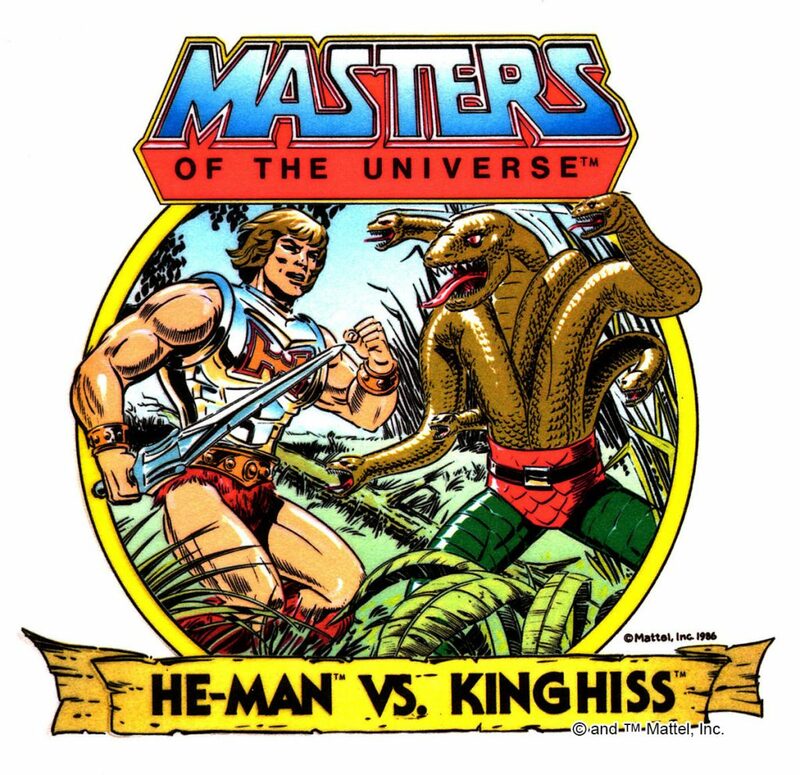 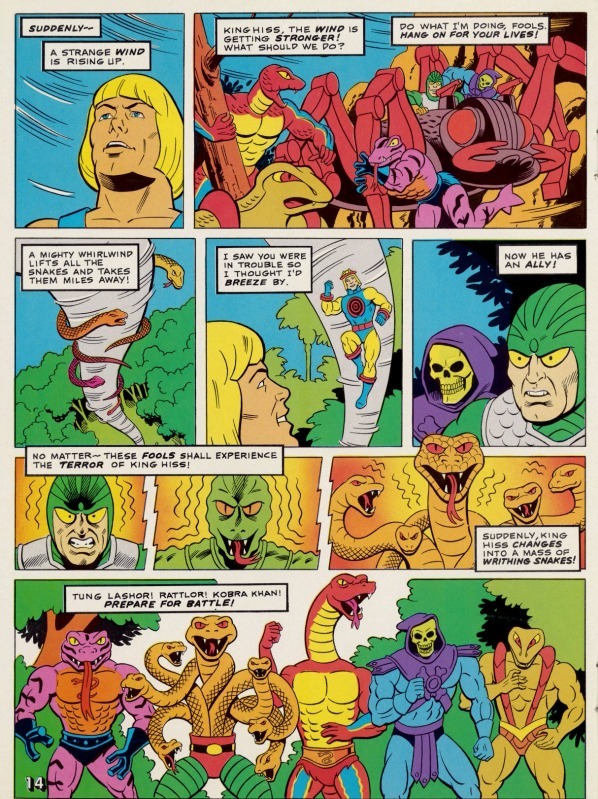 Learn how He-Man became so strong! 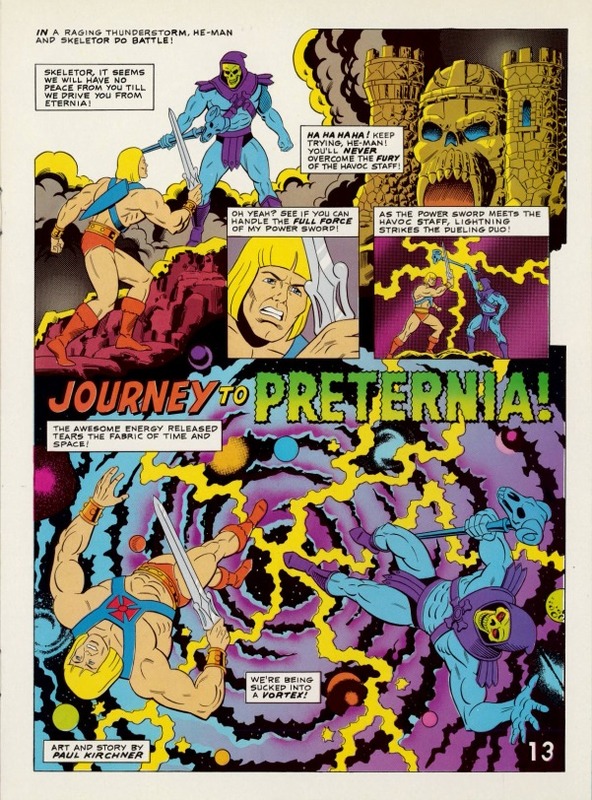 And explore the magical world of Preternia – home of HE-RO, the Most Powerful WIZARD in the Universe! 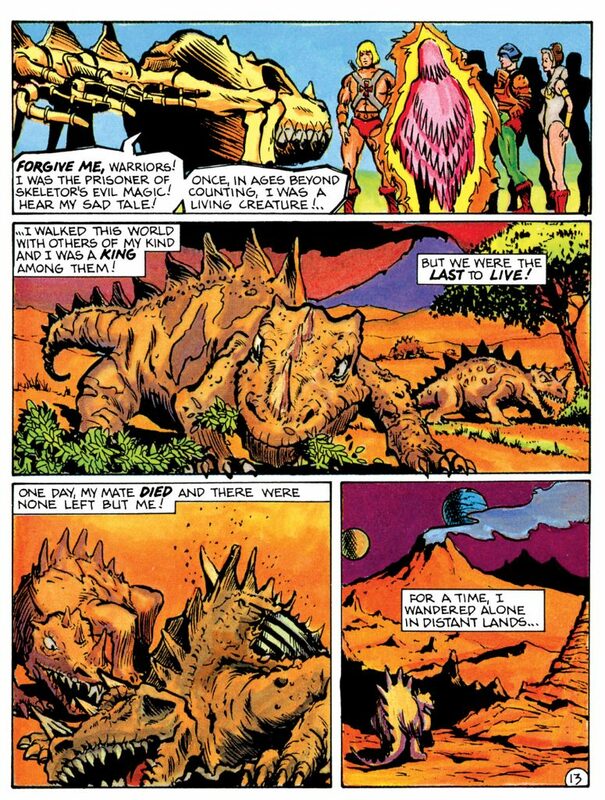 Monstrous dinosaurs and fierce giants – both good and evil – struggle violently for control of this strange & hostile land! 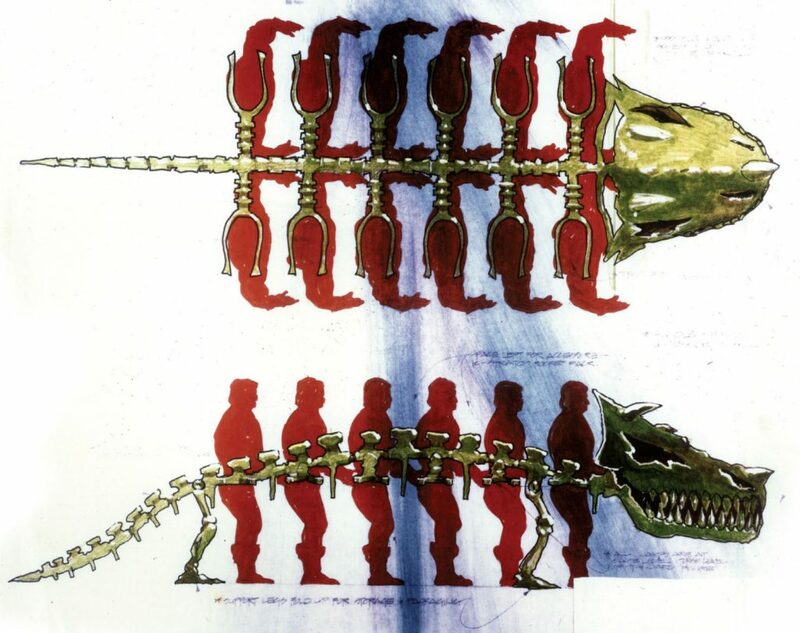 The dinosaurs in the time of HE-RO – Tyrantisaurus Rex, Bionatops and Turbodactyl – each posess a fantastic mechanical power. 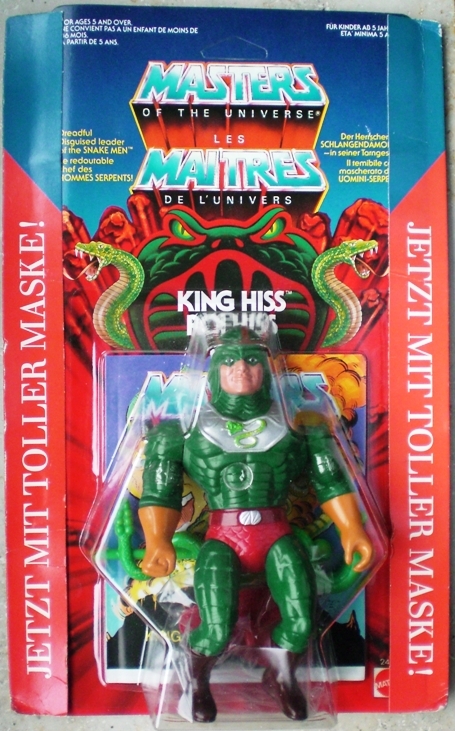 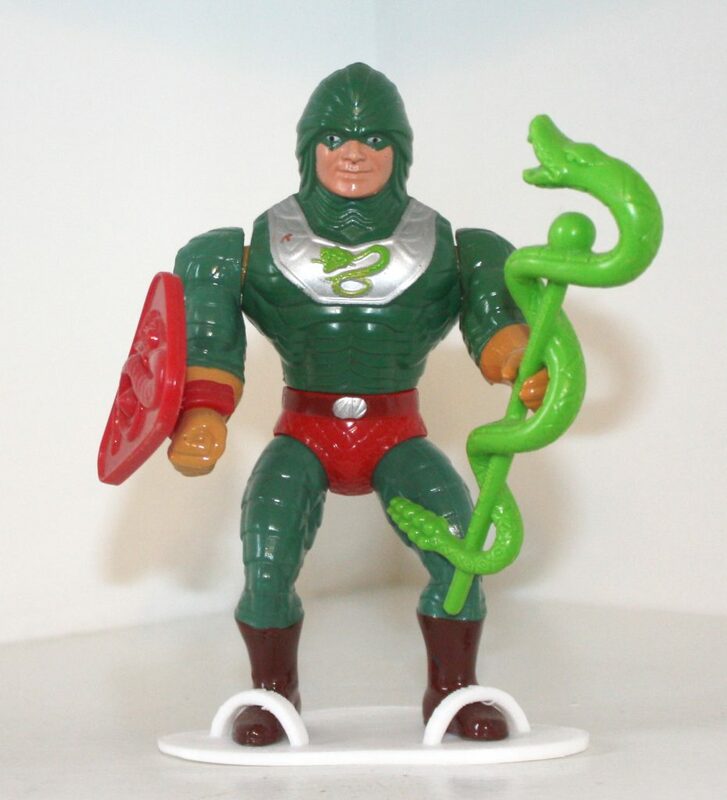 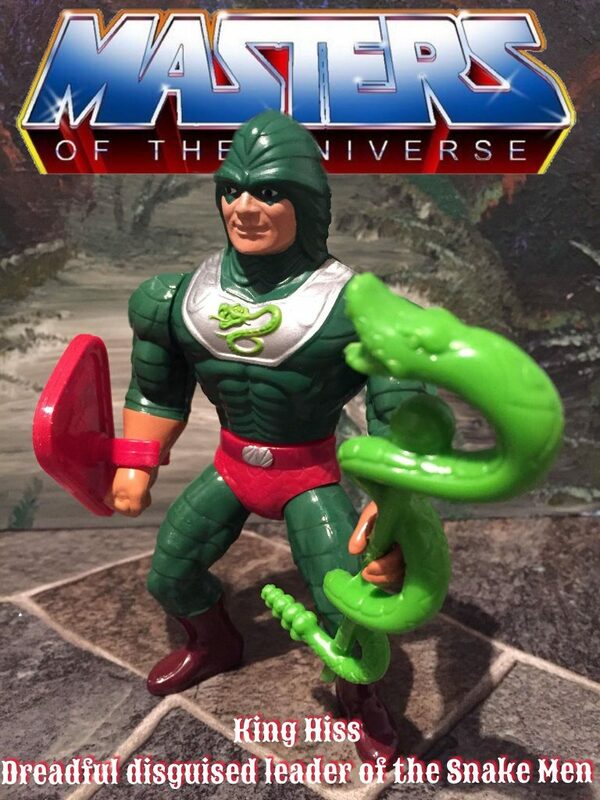 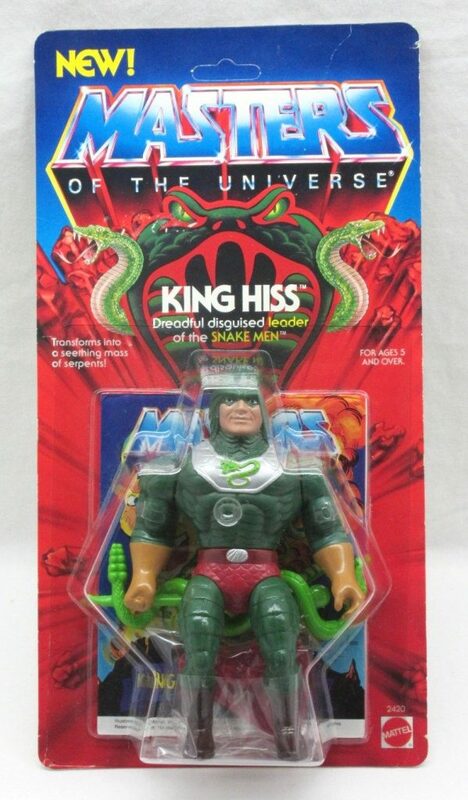 Can HE-RO master all the good magic of the Ancient Wizards and protect future Eternia from forever falling into the claws of evil? 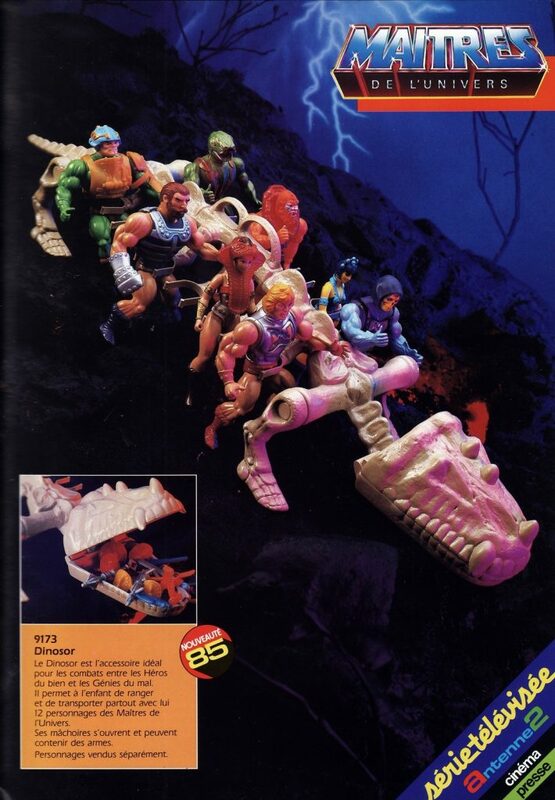 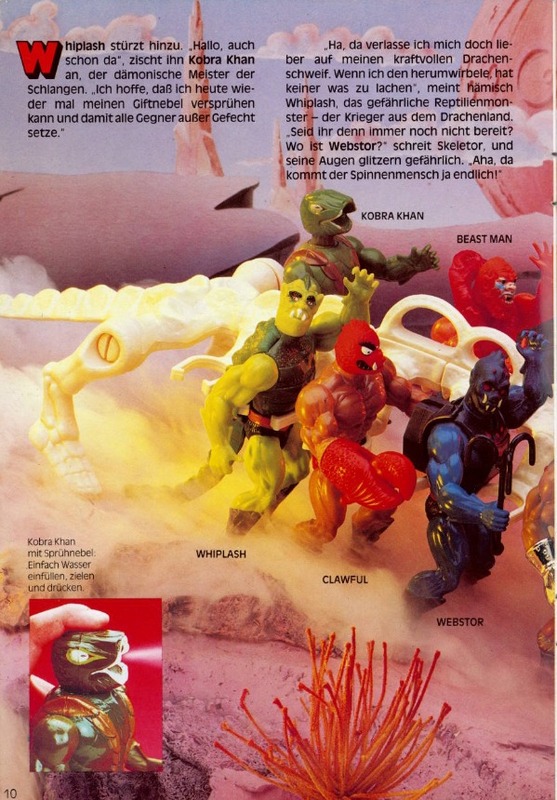 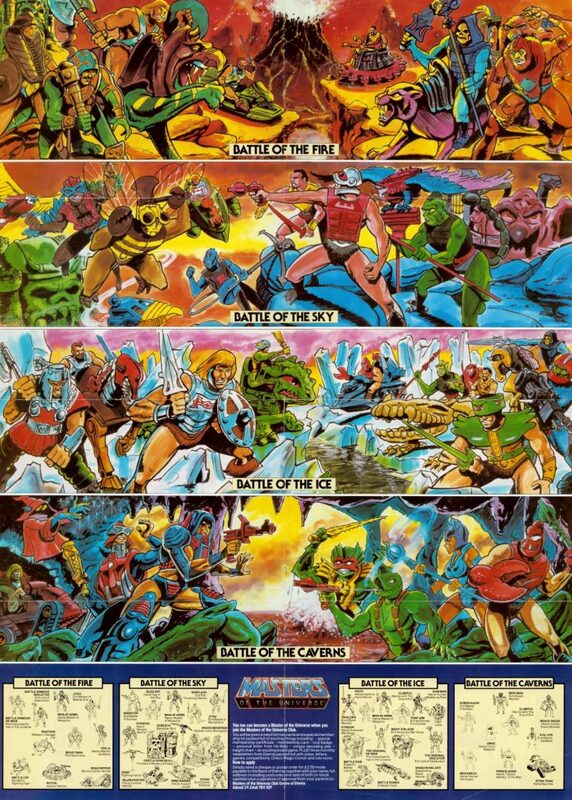 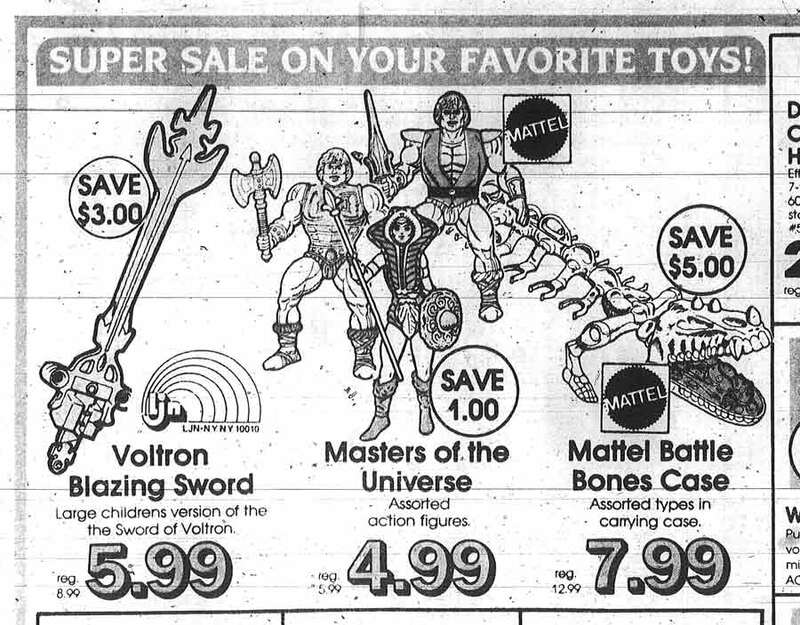 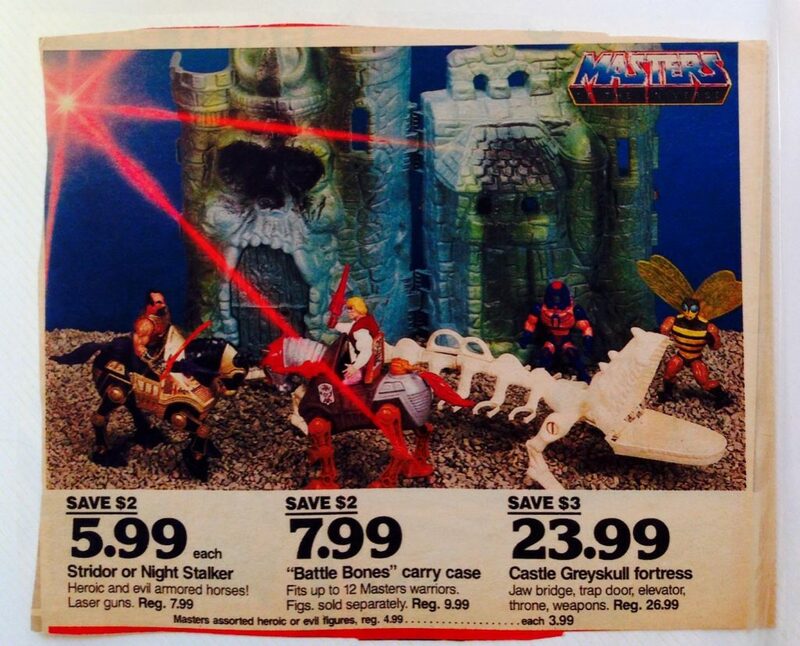 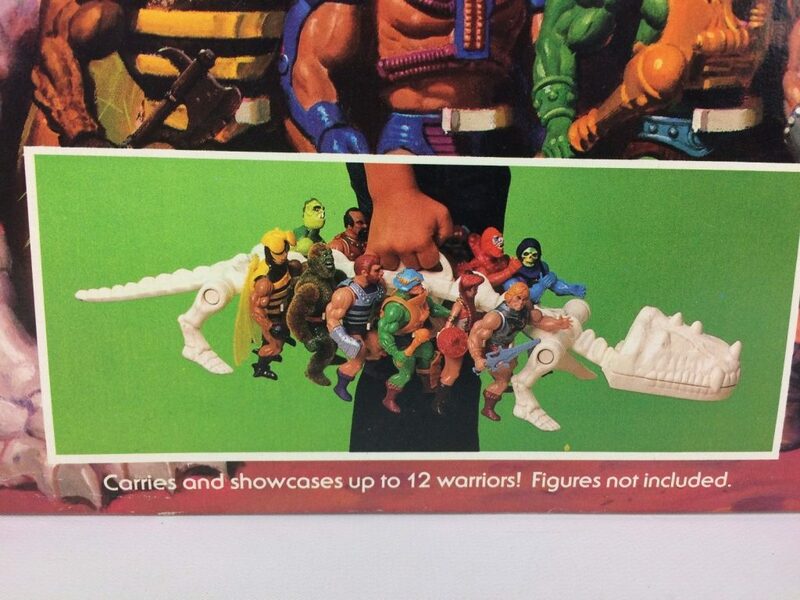 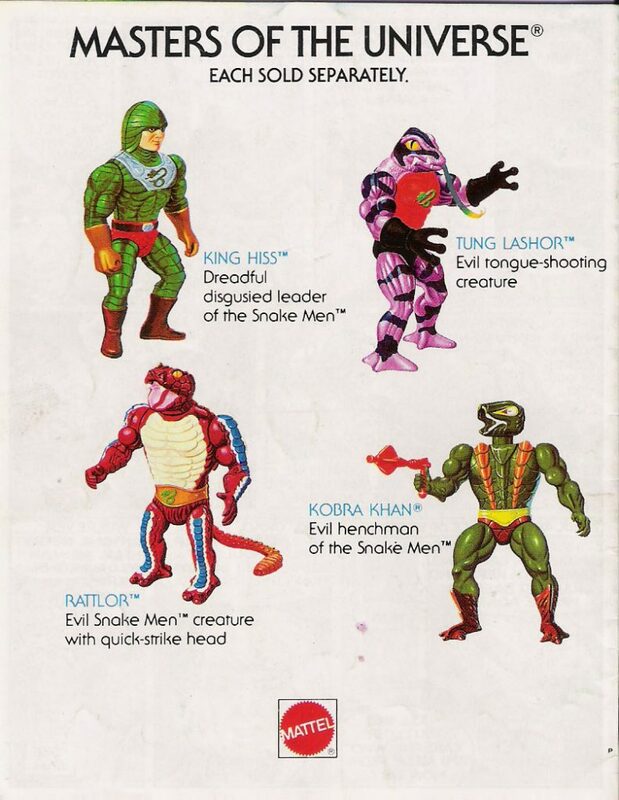 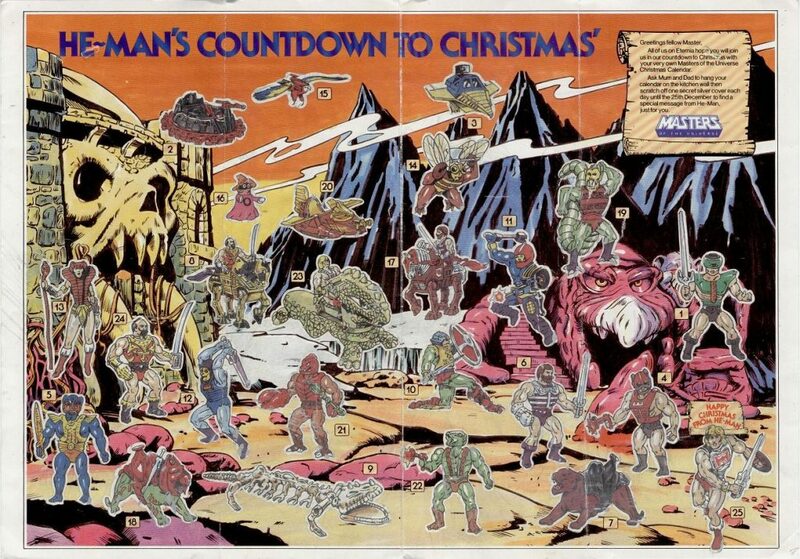 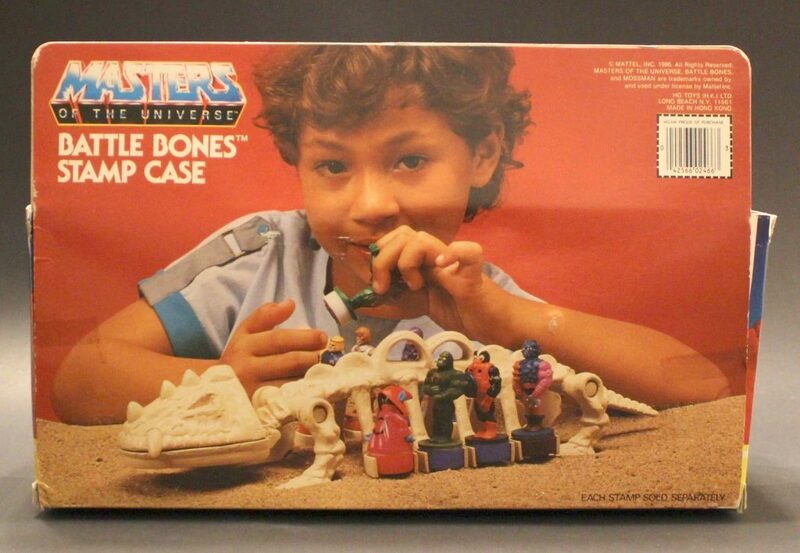 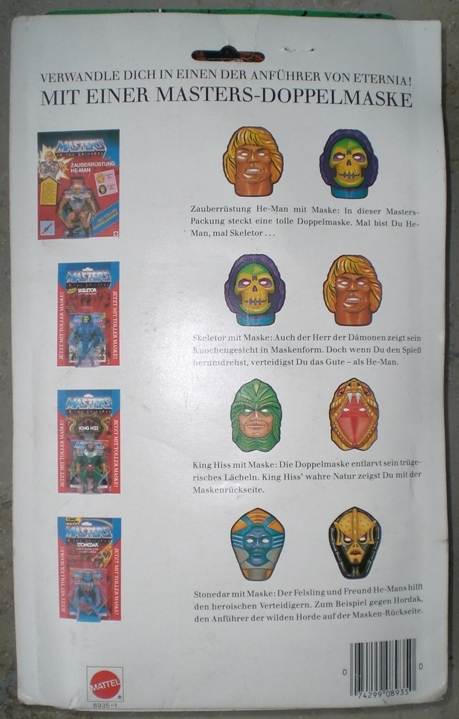 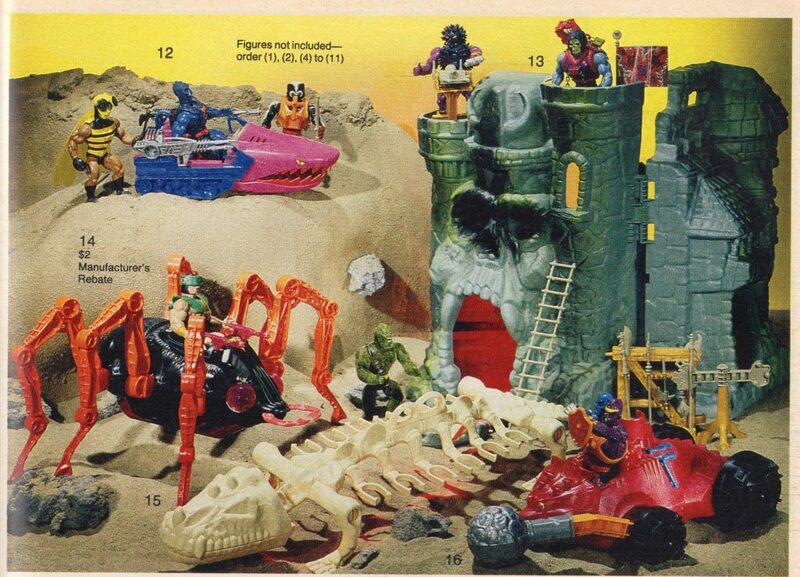 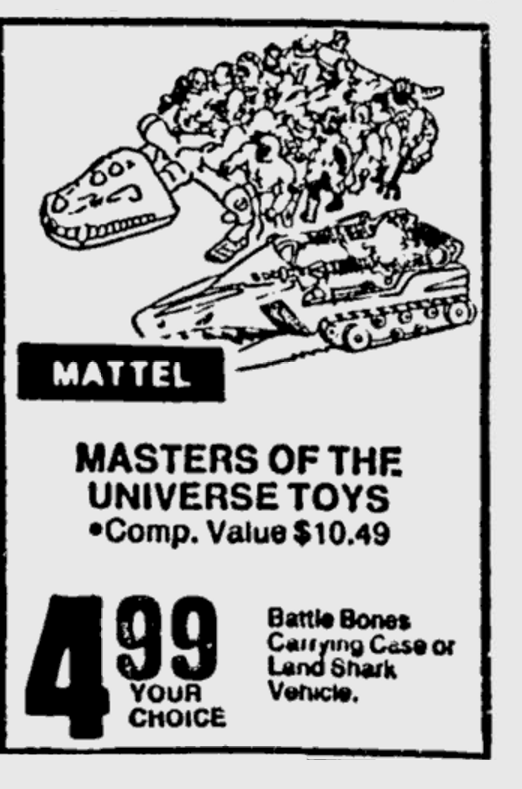 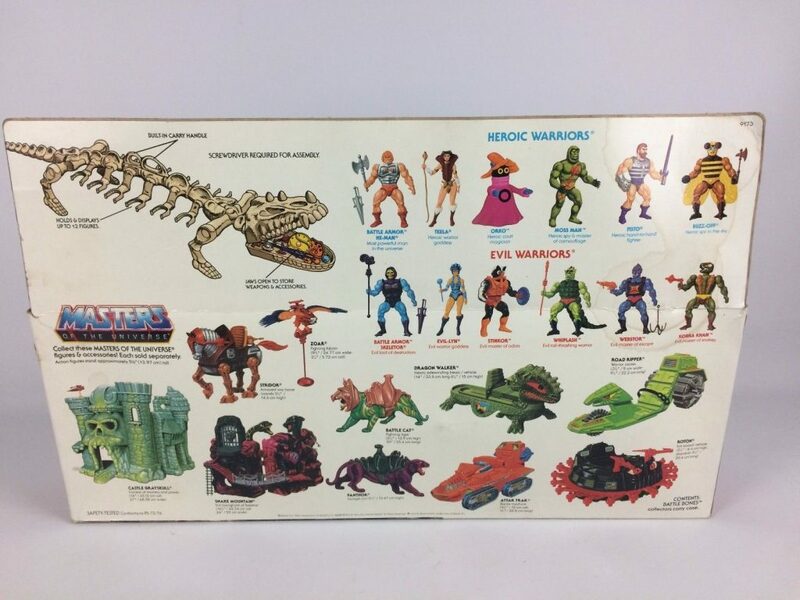 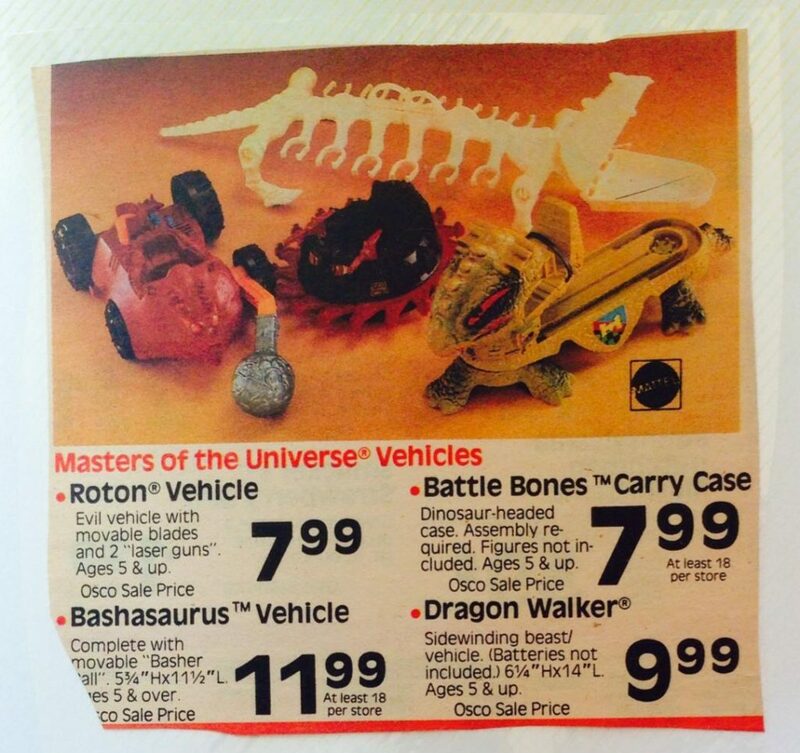 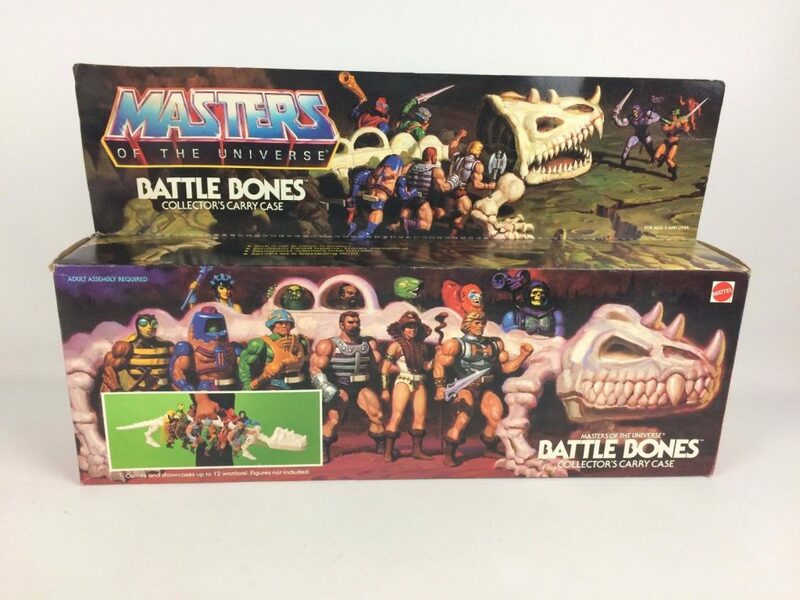 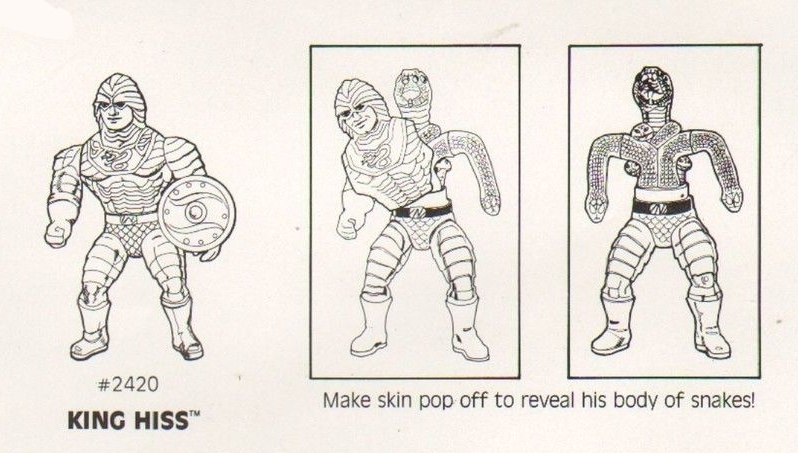 Look for He-Ro and the Powers of Grayskull coming your way in 1987! 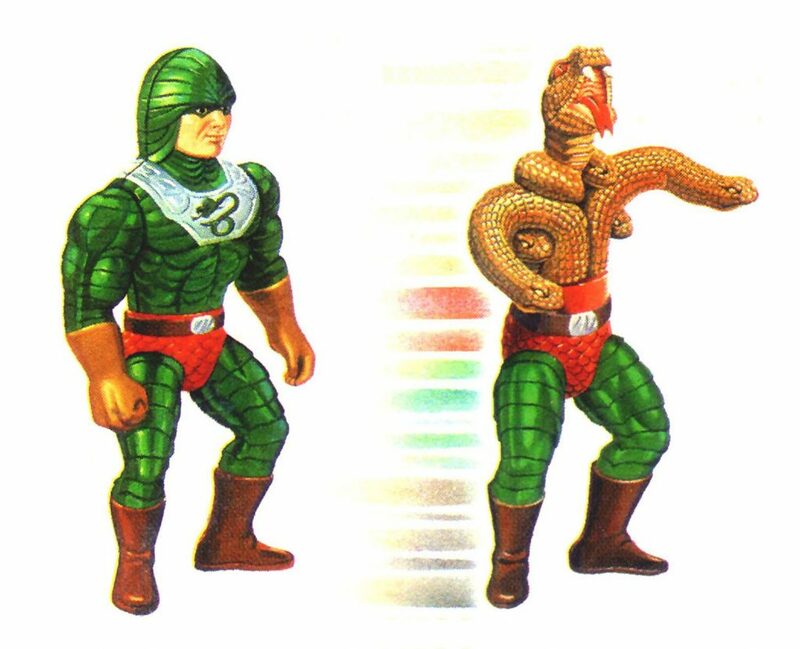 He-Ro was never released of course, although a replica of the unproduced figure will be available in 2019 from Super7. 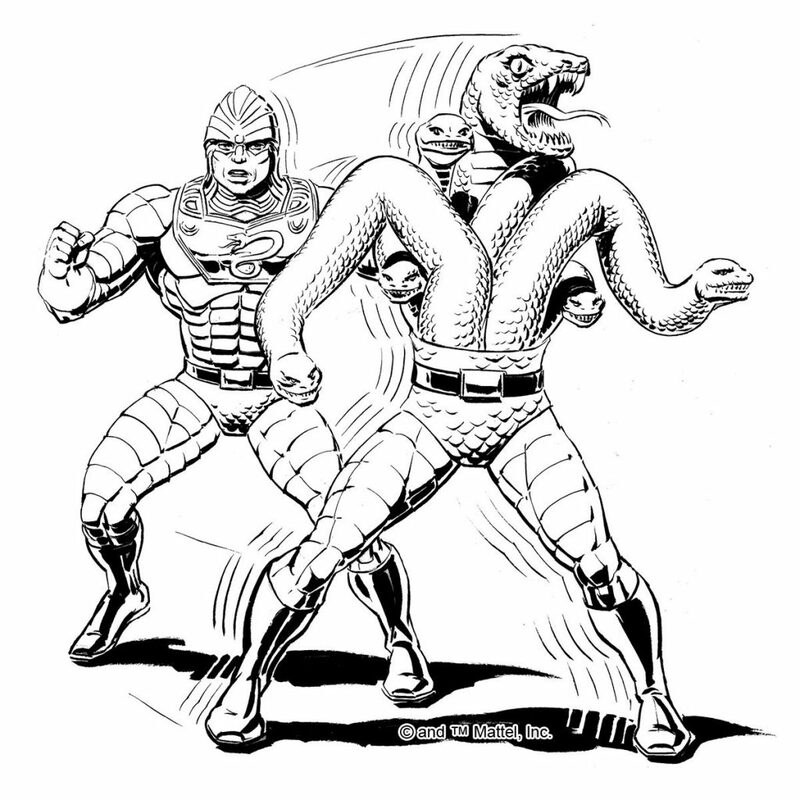 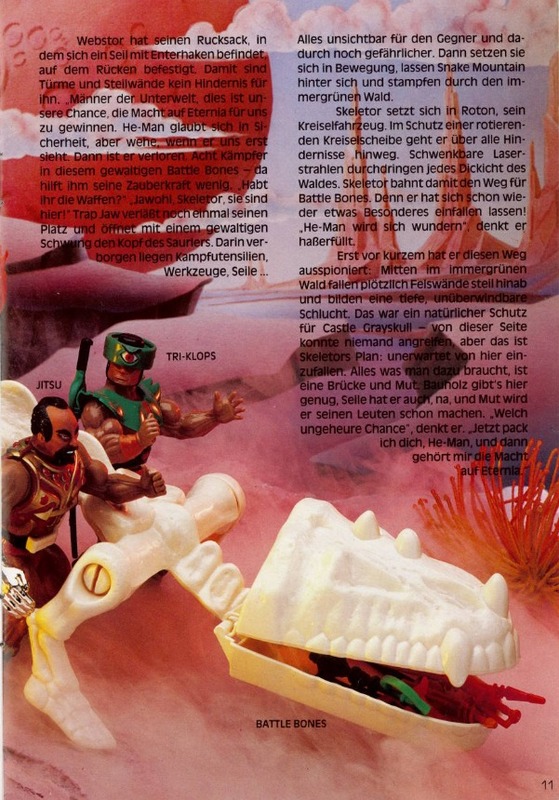 The giants mentioned in the text were Tytus and Megator, which ended up being offered for sale in Europe in 1988, but not in the US. 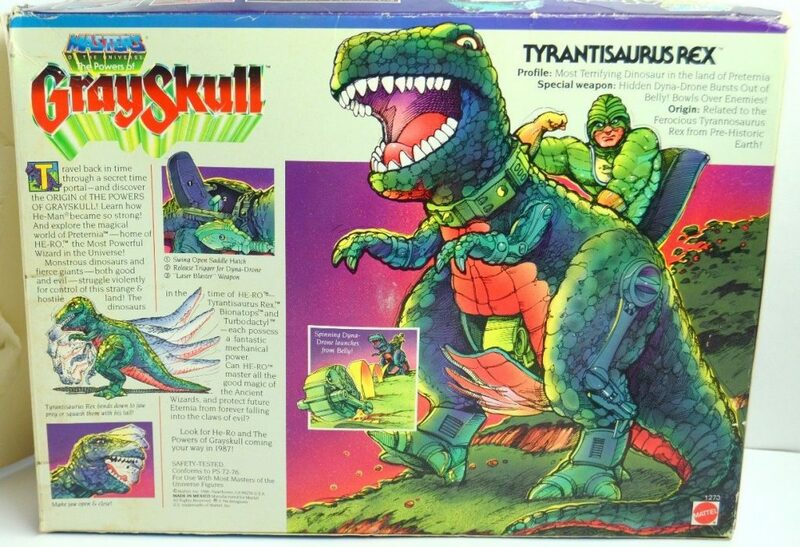 Tyrantisaurus is depicted on the back and front of the box as being ridden by King Hiss, which was also the case in the minicomics, as we will see later. 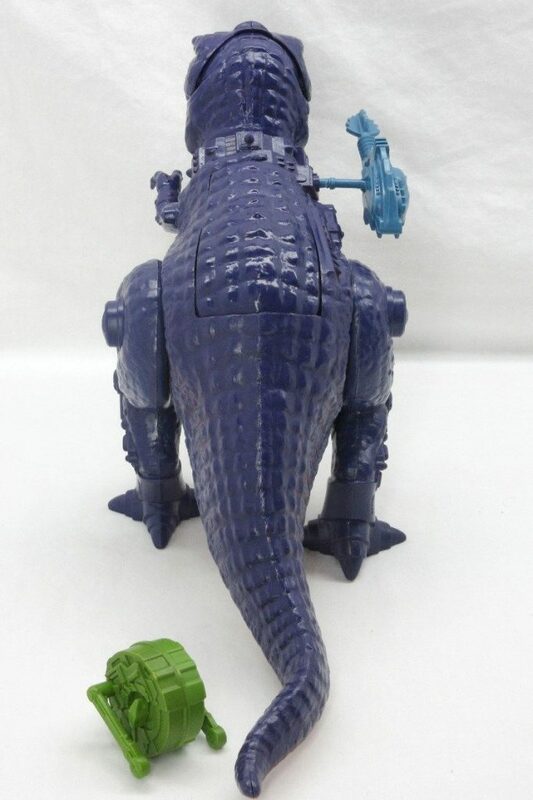 Special weapon: Hidden Dyna-Drone bursts out of Belly! 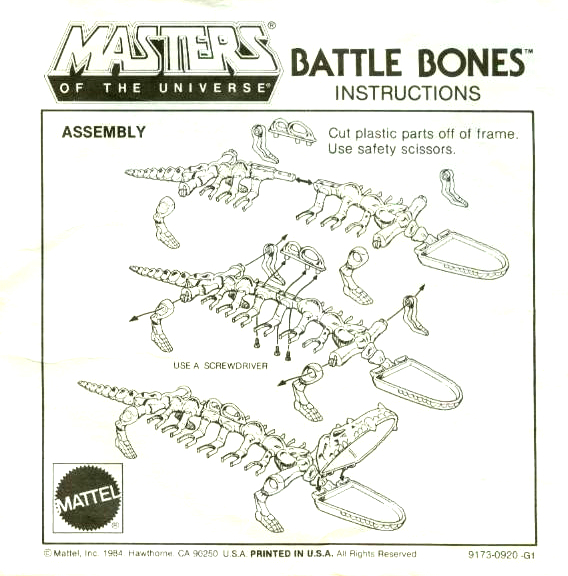 Bowls Over Enemies! 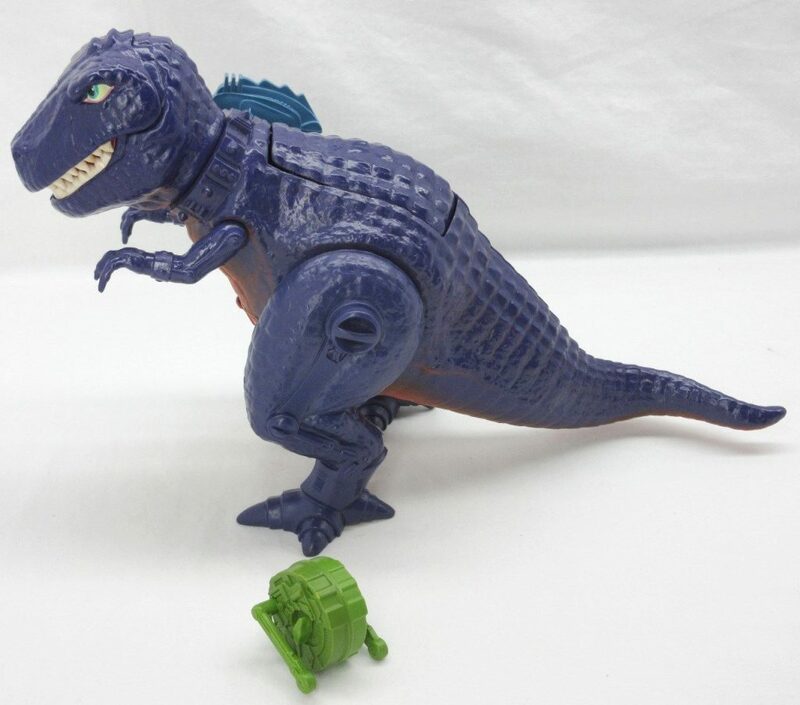 Origin: Related to the Ferocious Tyrannosaurus Rex from Pre-Historic Earth! 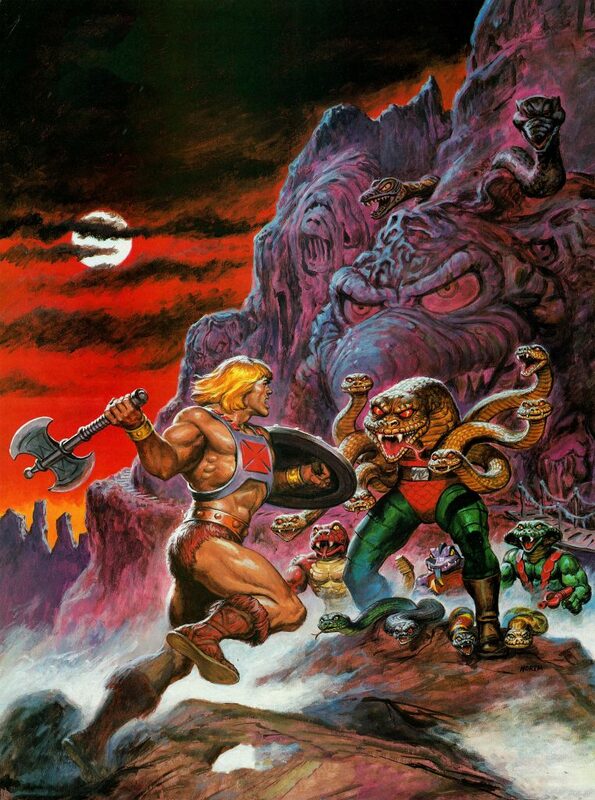 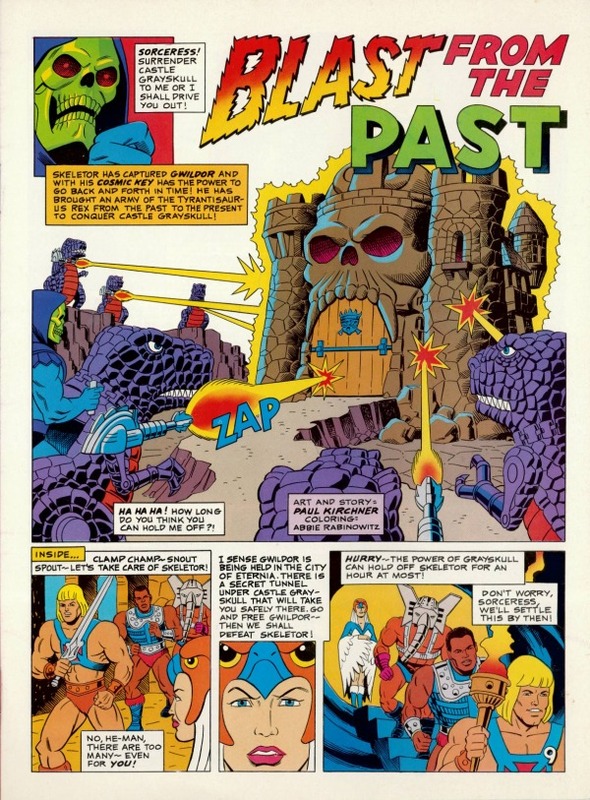 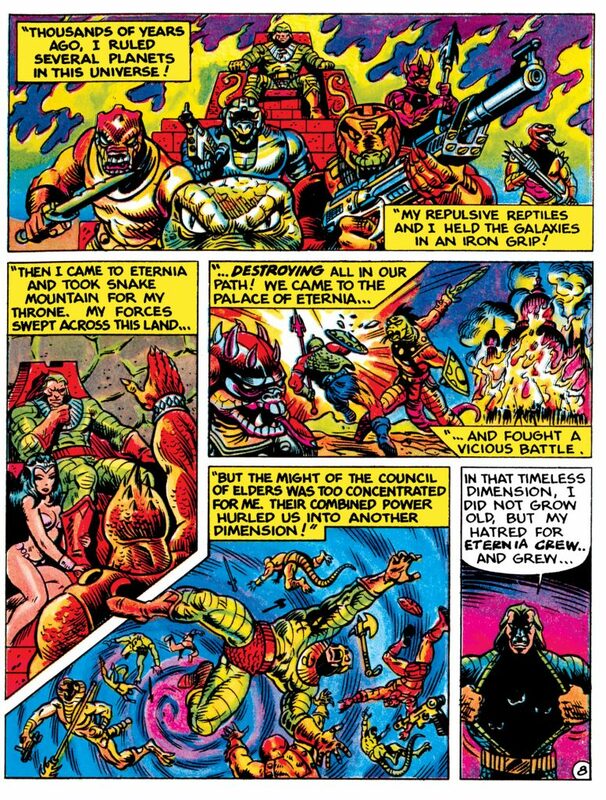 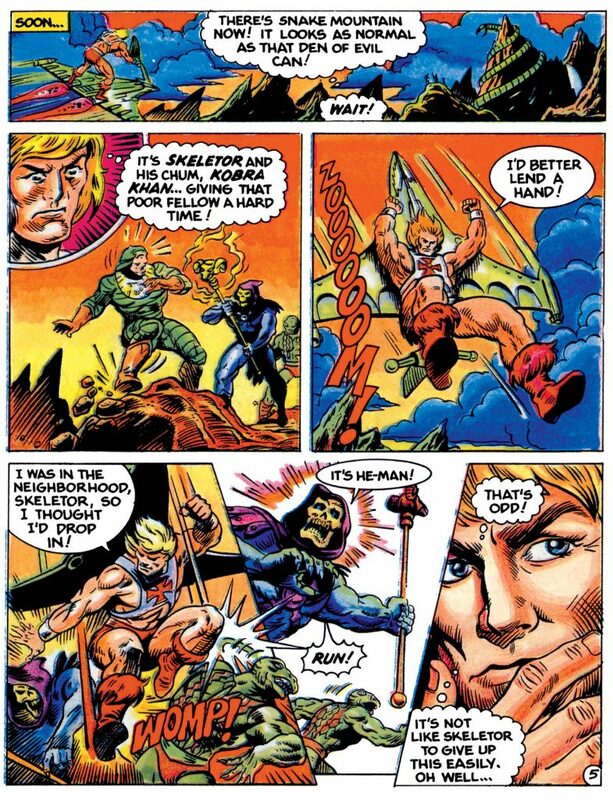 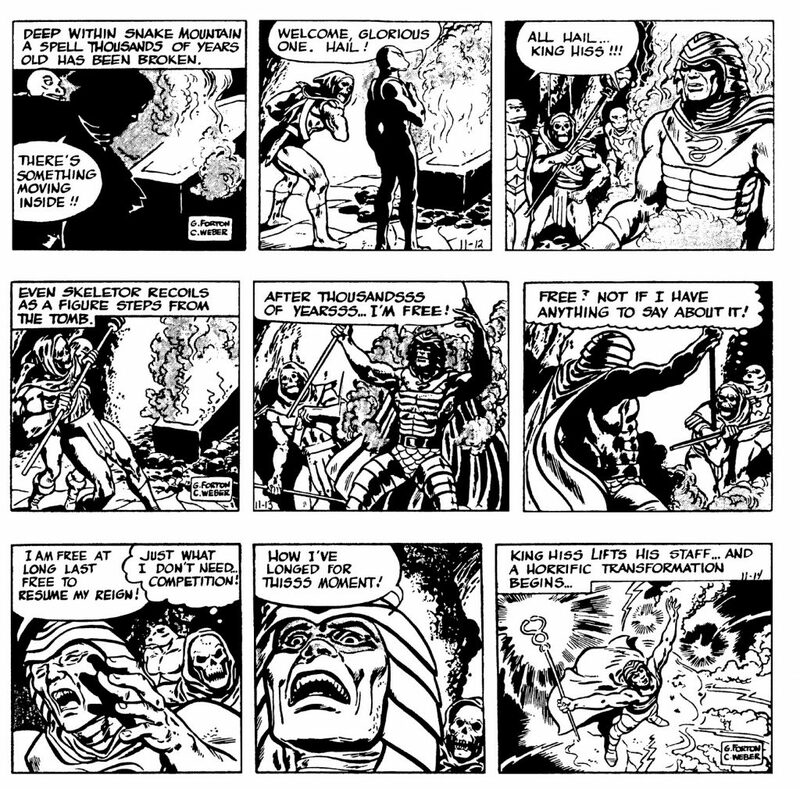 The Powers of Grayskull: The Legend Begins was to be the first of a “3 part saga.” Unfortunately with the cancellation of the line, the next two parts were never published. 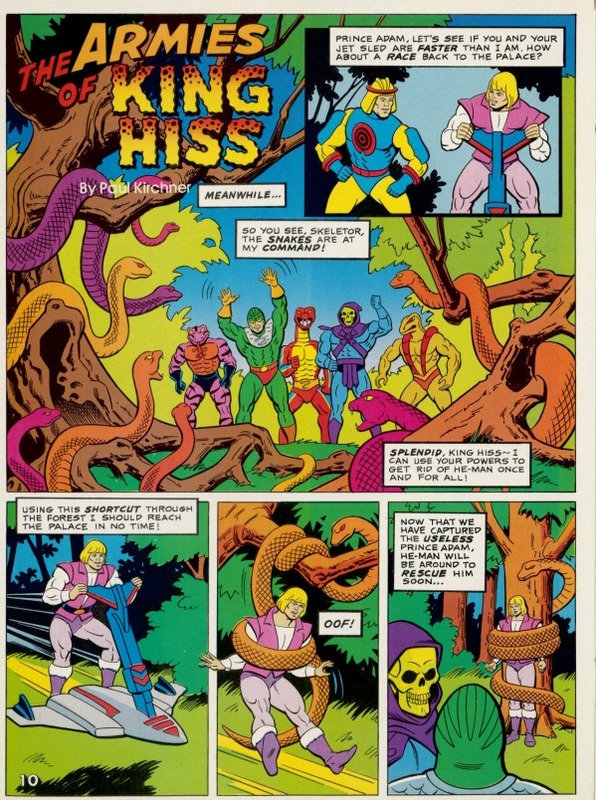 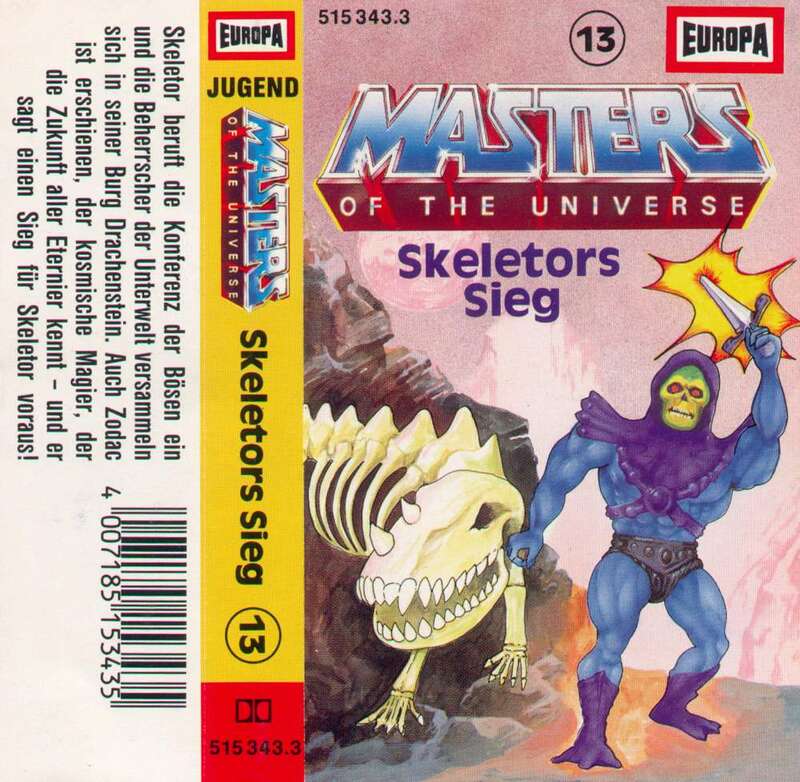 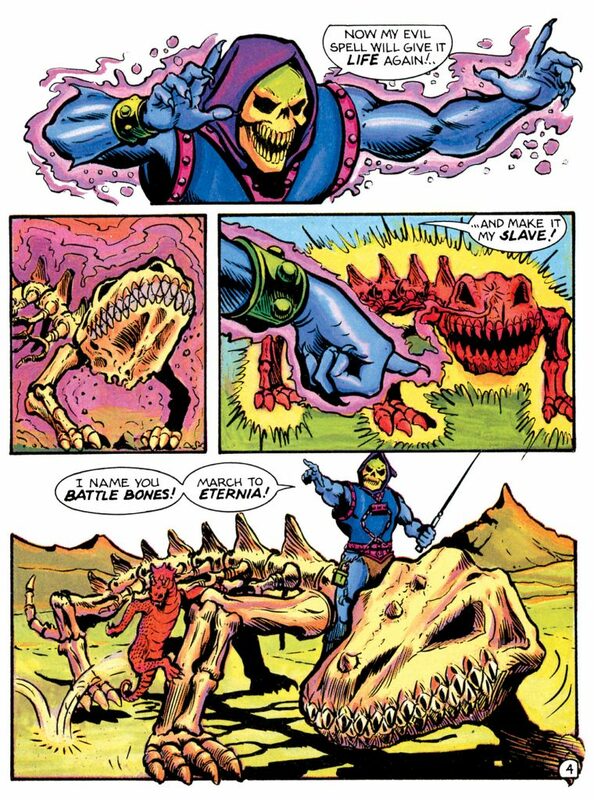 In the story, Skeletor followed He-Man and Sorceress back in time to ancient Preternia, where he allies with King Hiss and causes trouble. 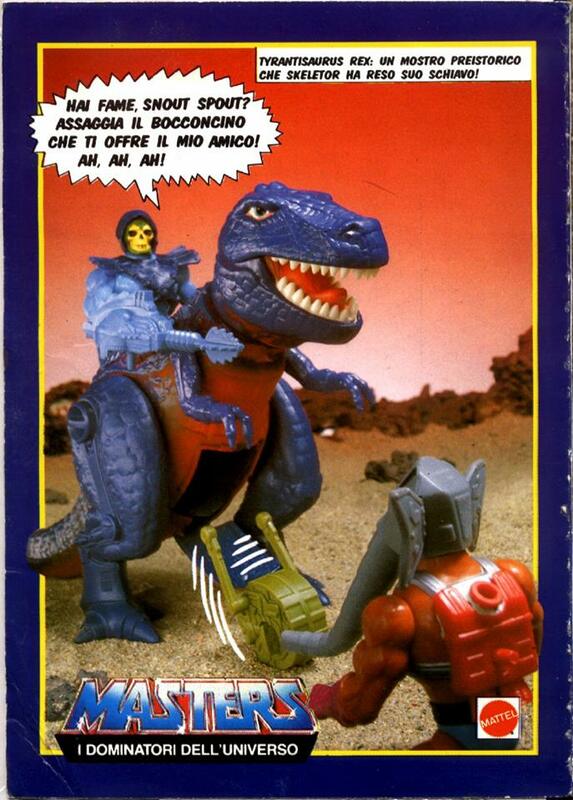 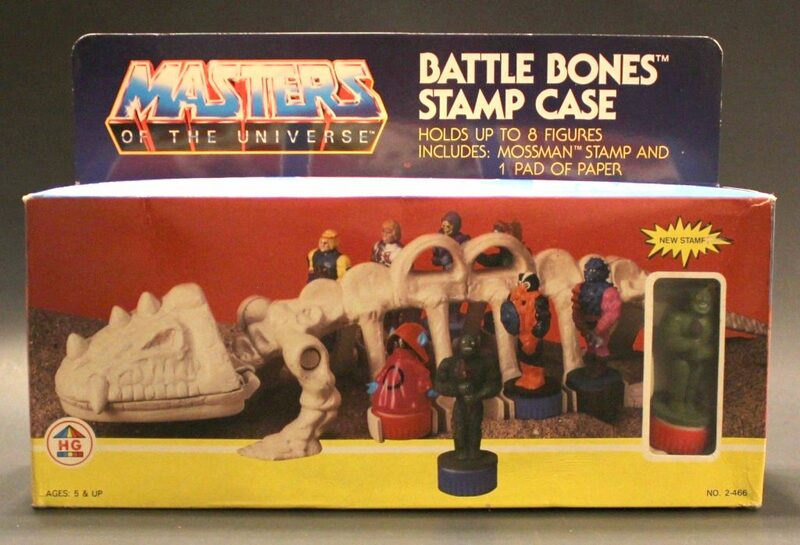 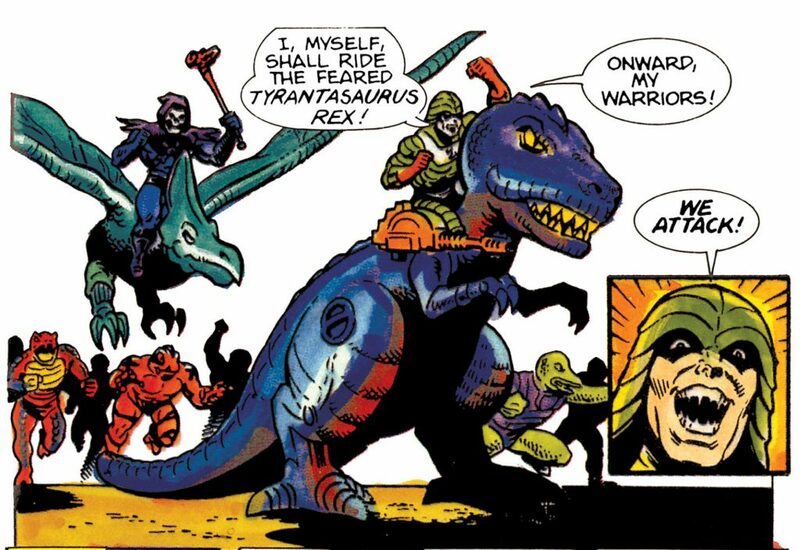 A battle ensues, with a disguised He-Man riding Bionatops and King Hiss on Tyrantisaurus. 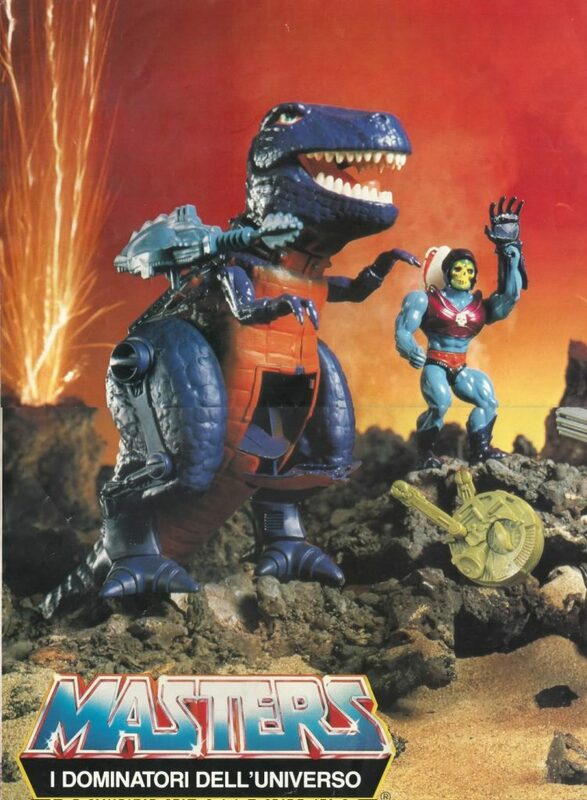 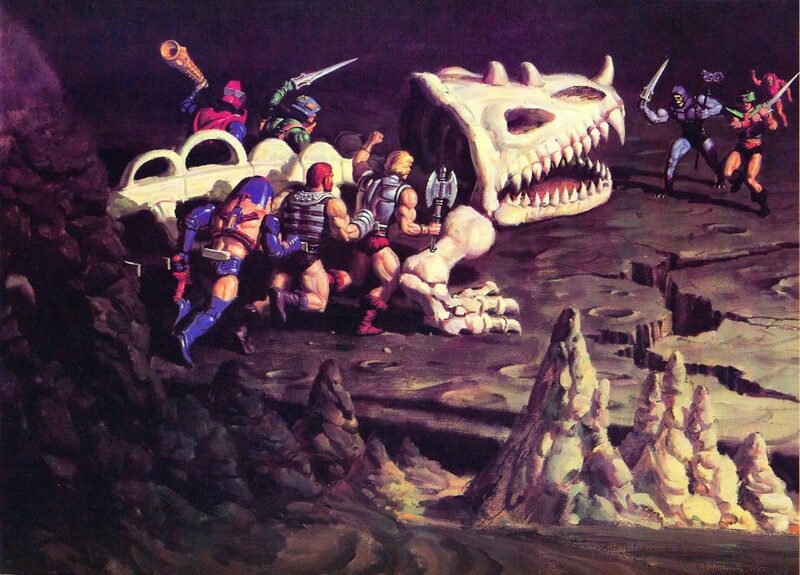 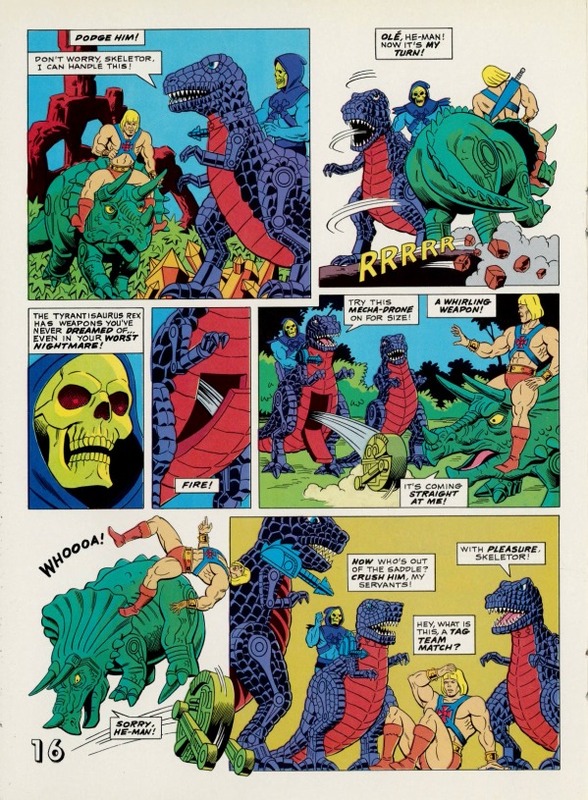 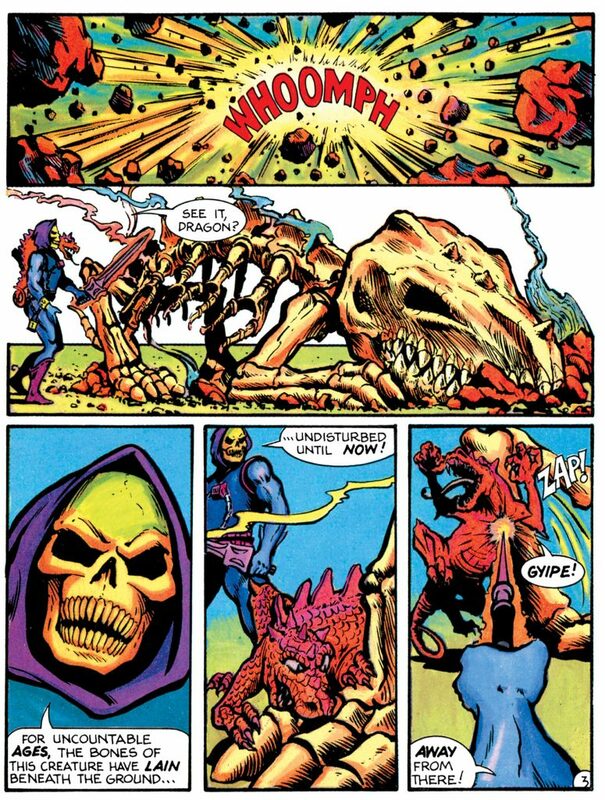 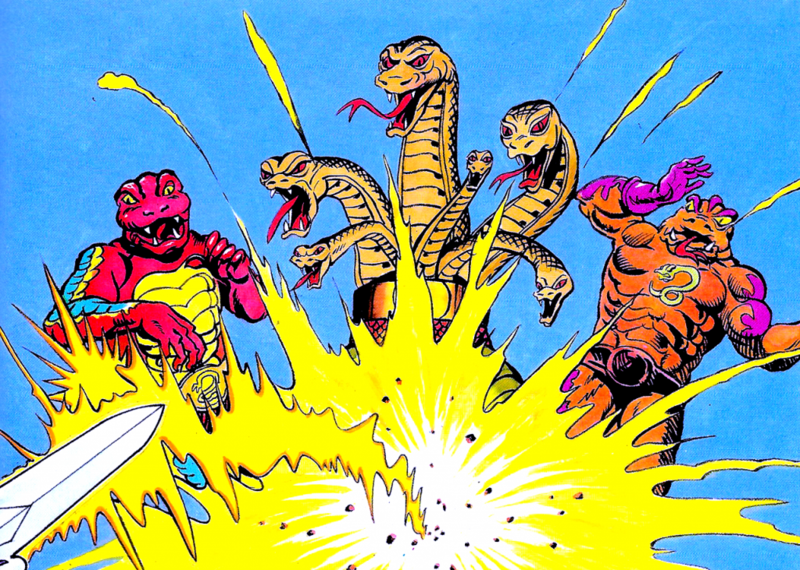 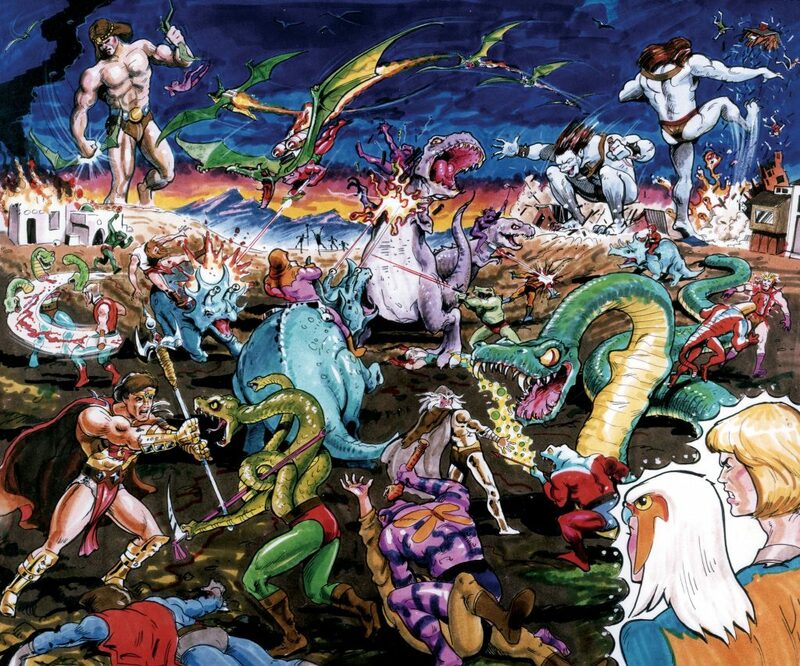 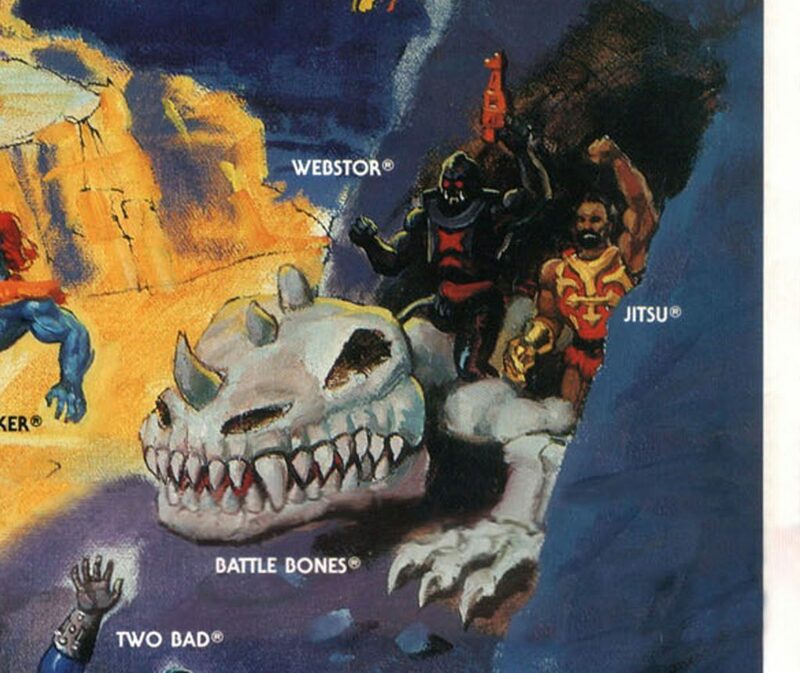 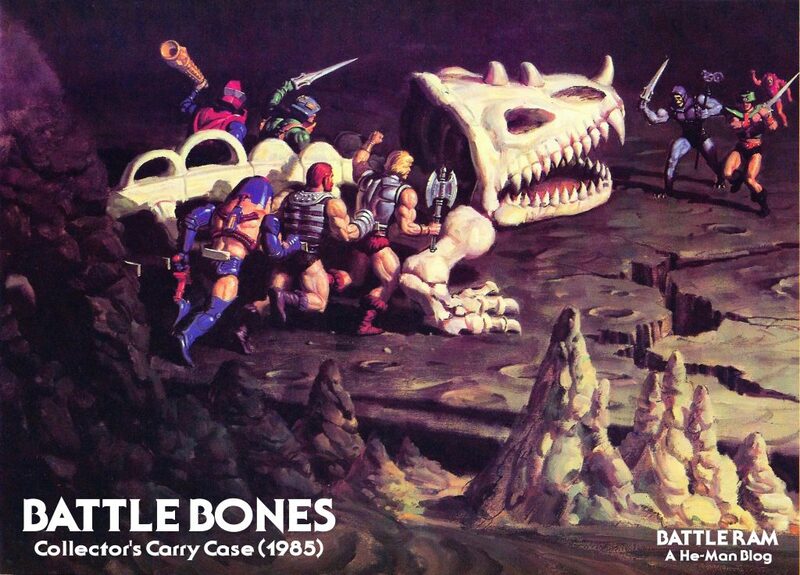 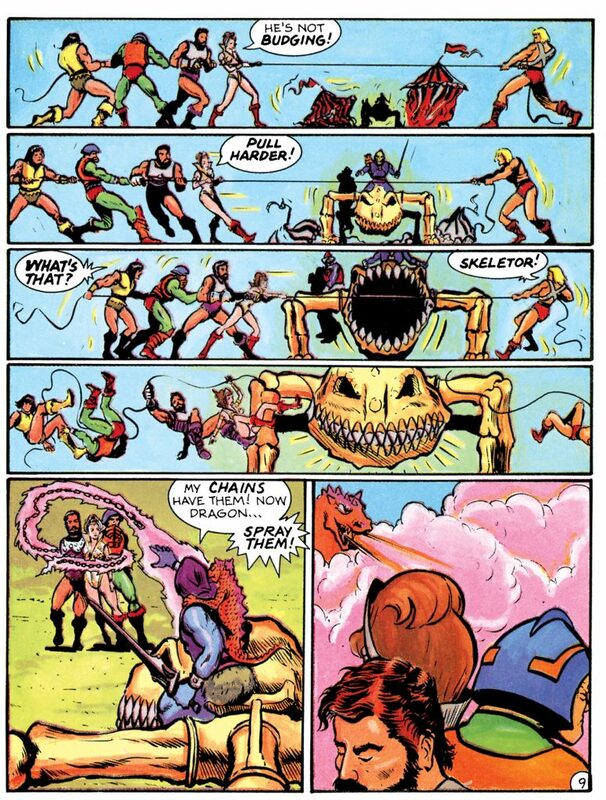 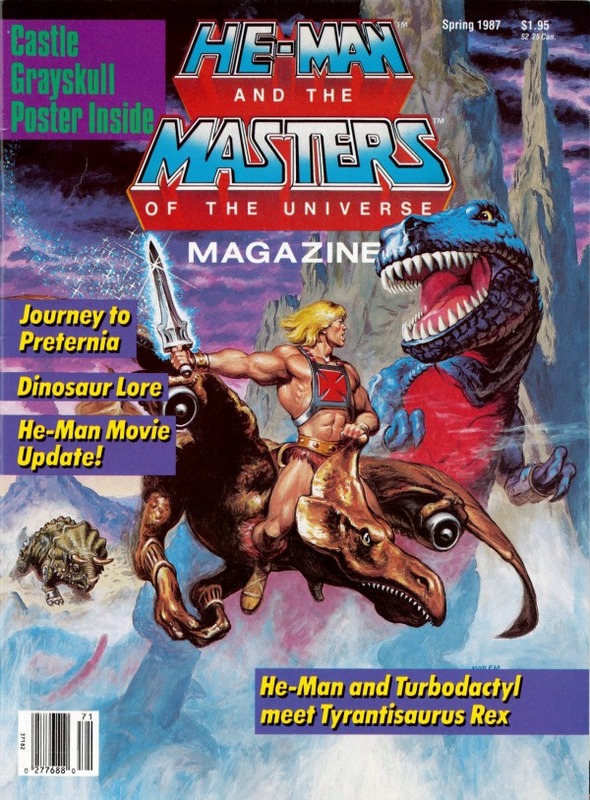 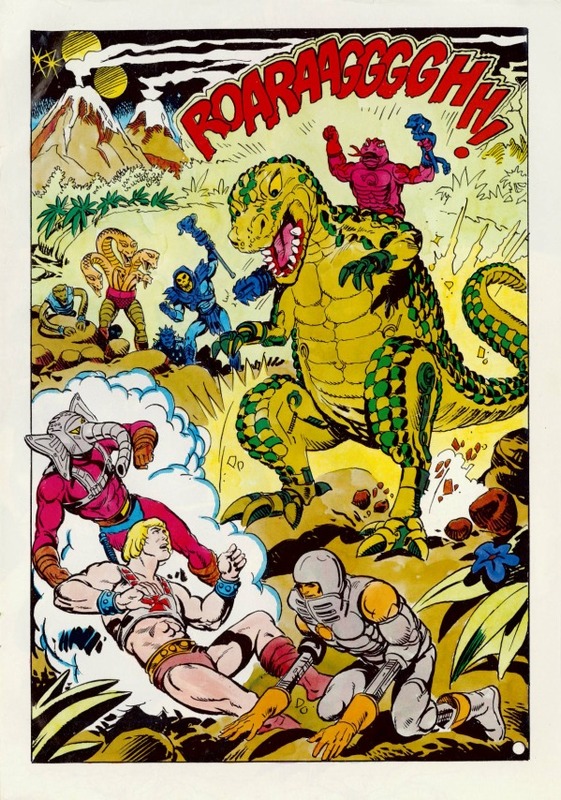 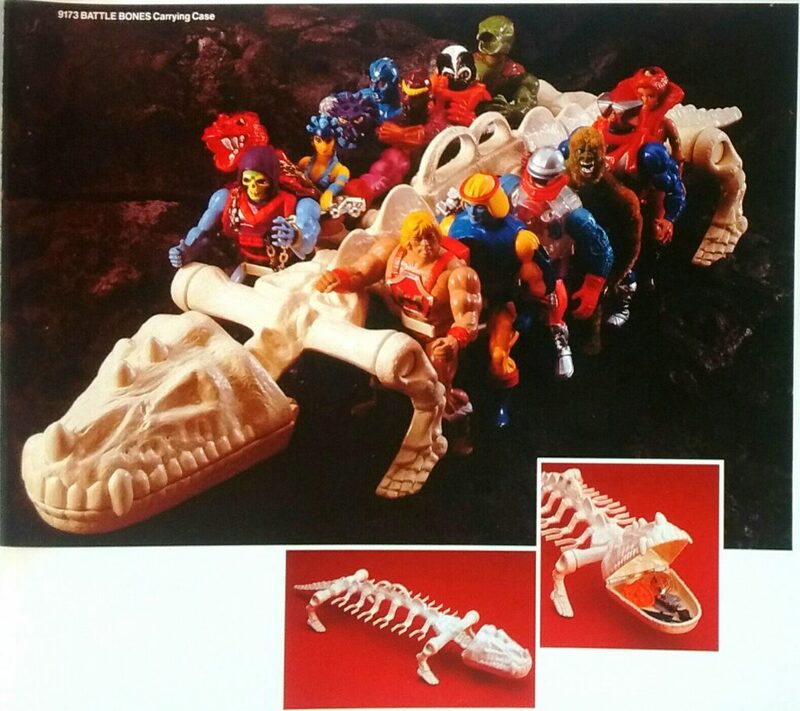 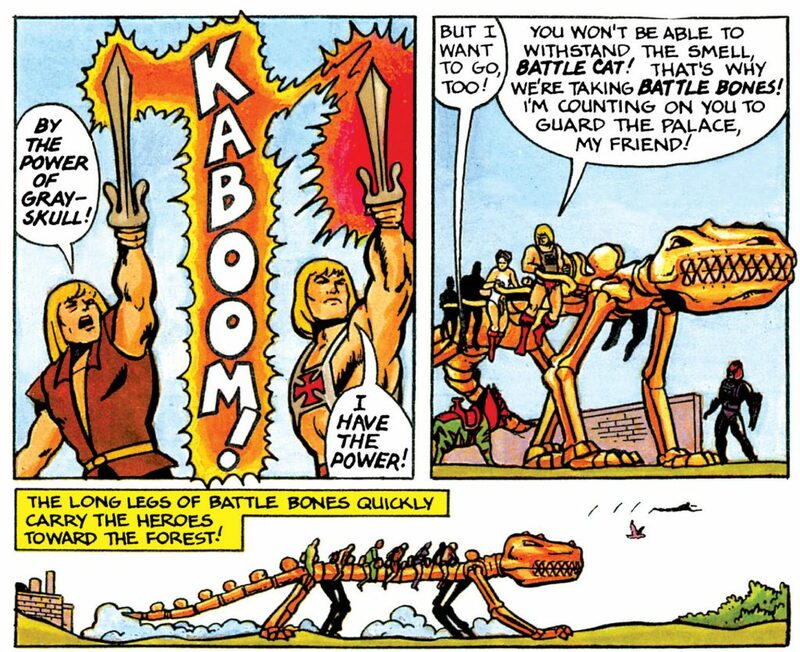 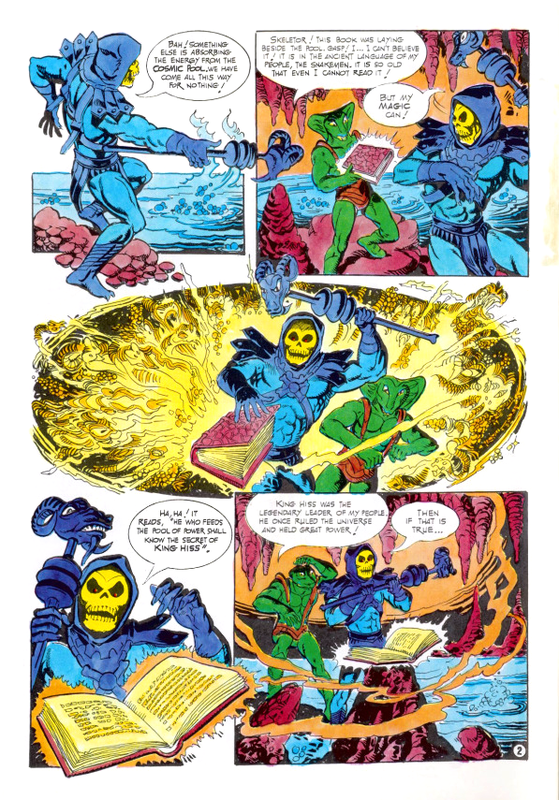 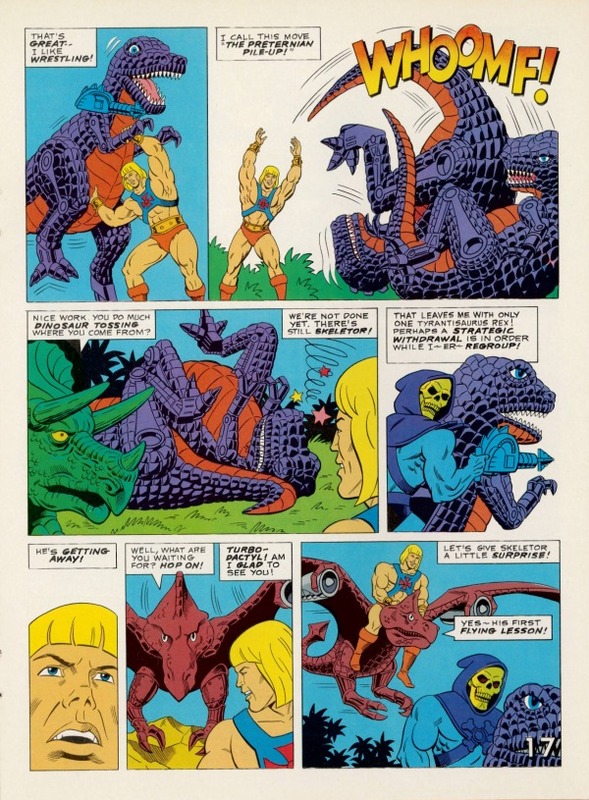 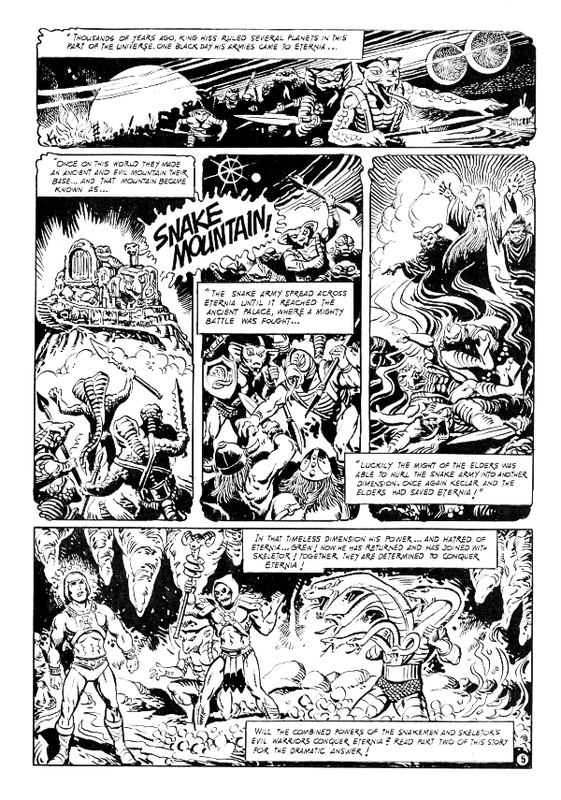 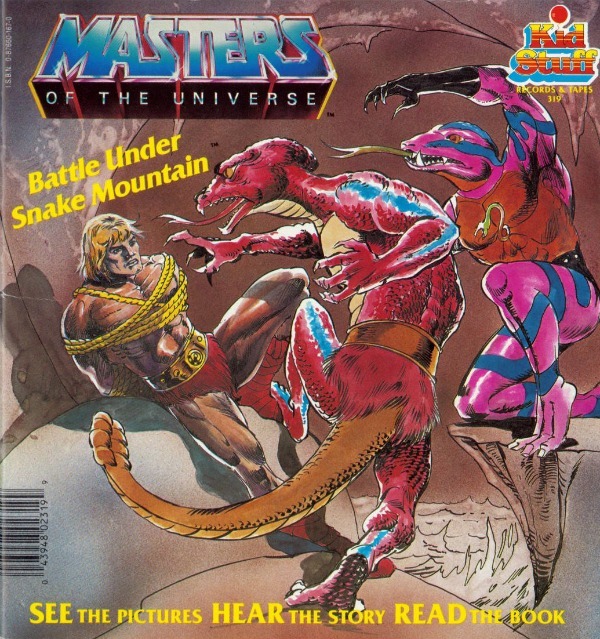 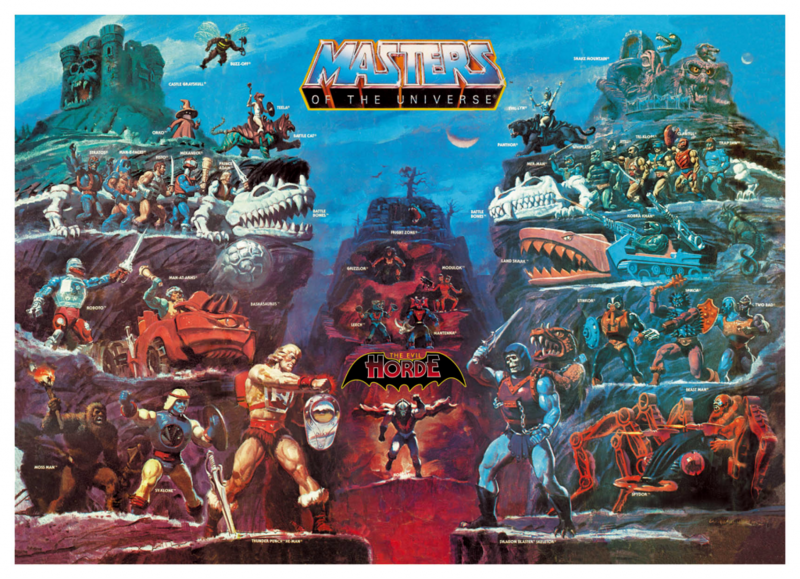 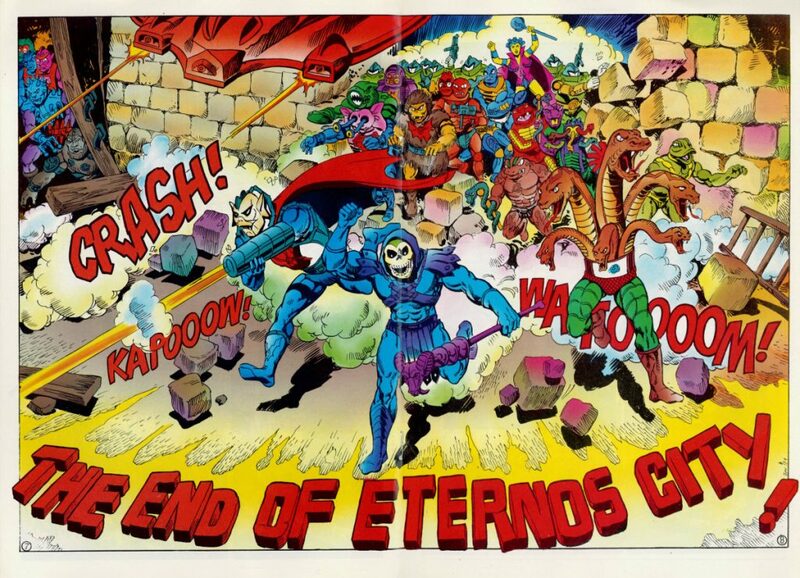 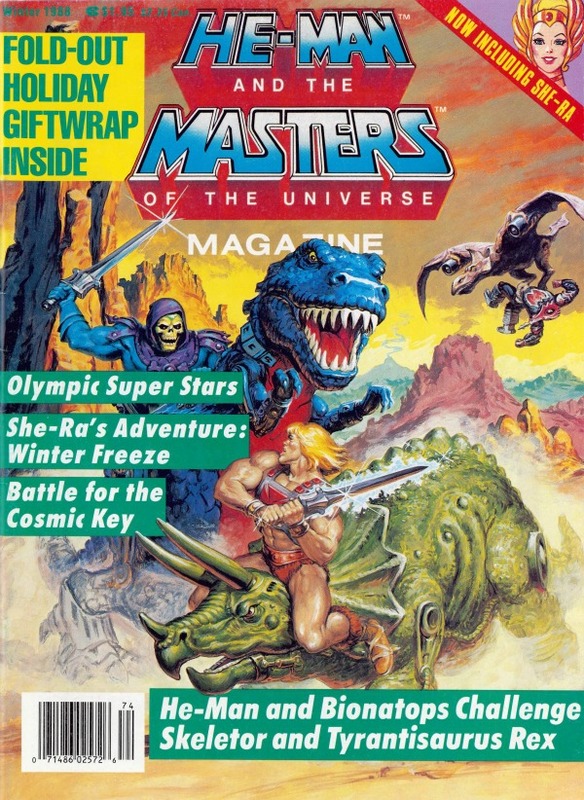 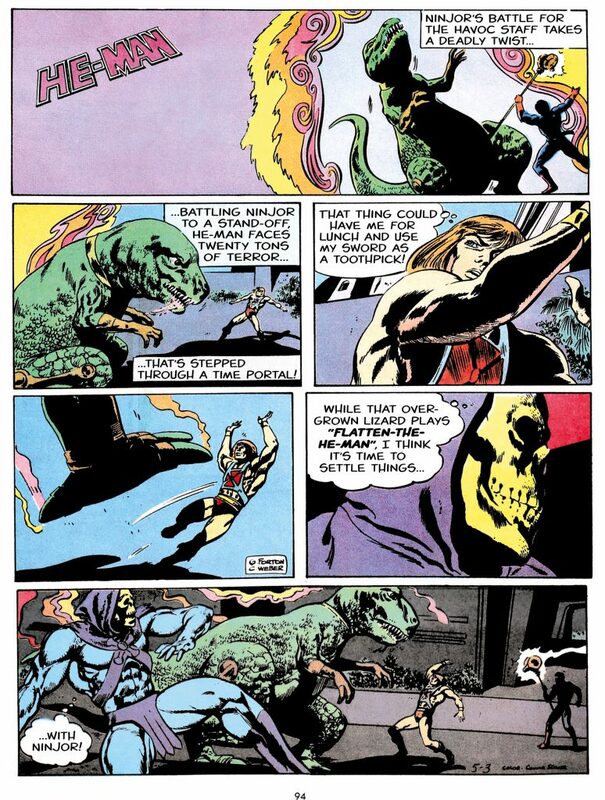 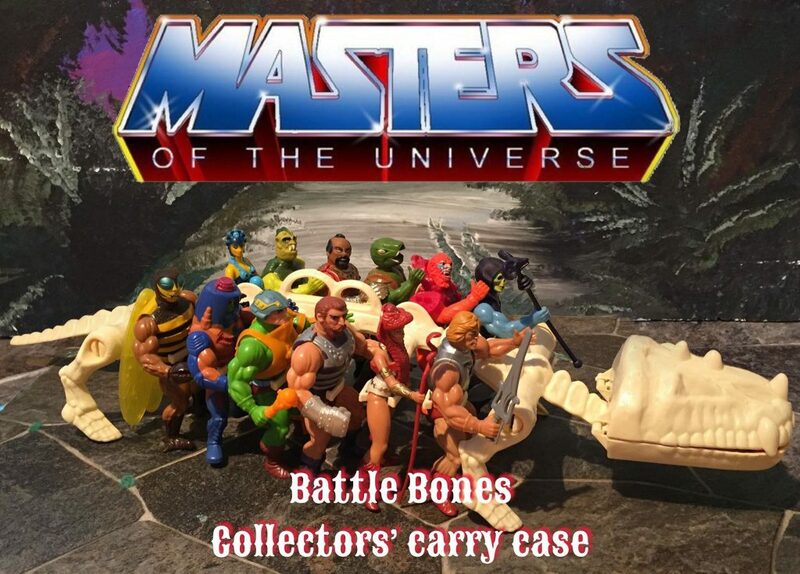 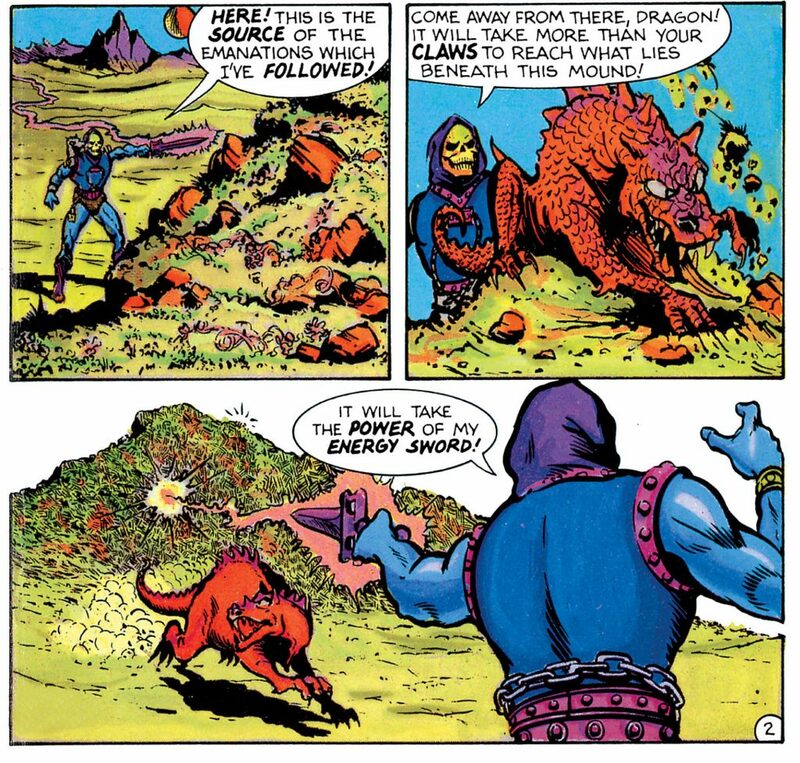 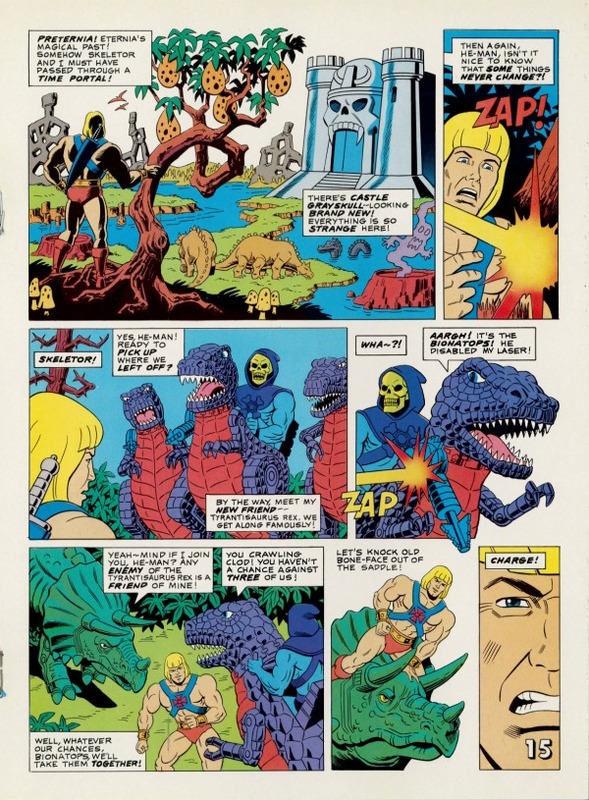 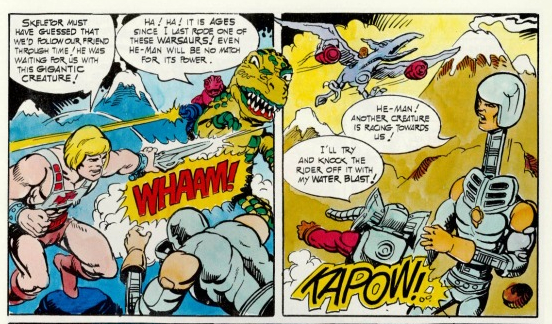 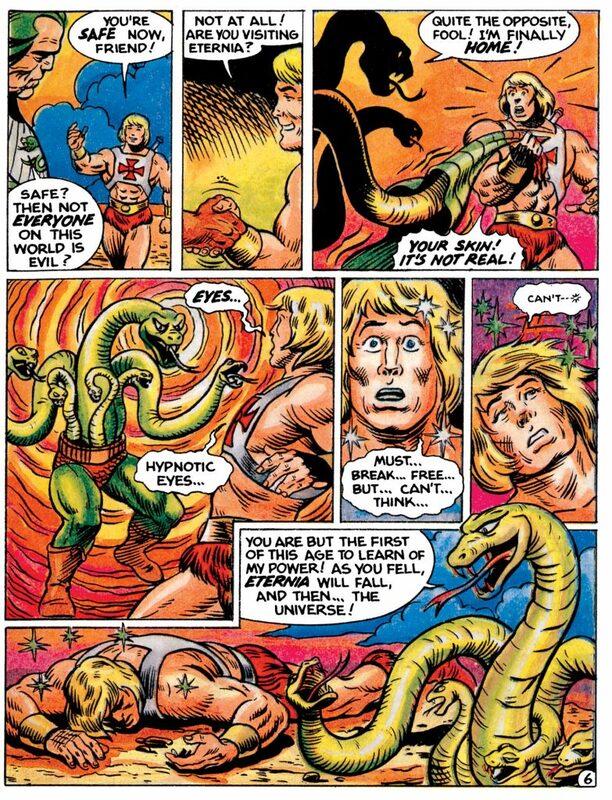 In Journey To Preternia, in the 1987 Spring issue of MOTU Magazine, Skeletor and He-Man accidentally travel through a time portal, and end up allying with their respective dinosaurs and hashing things out in a predictable way. 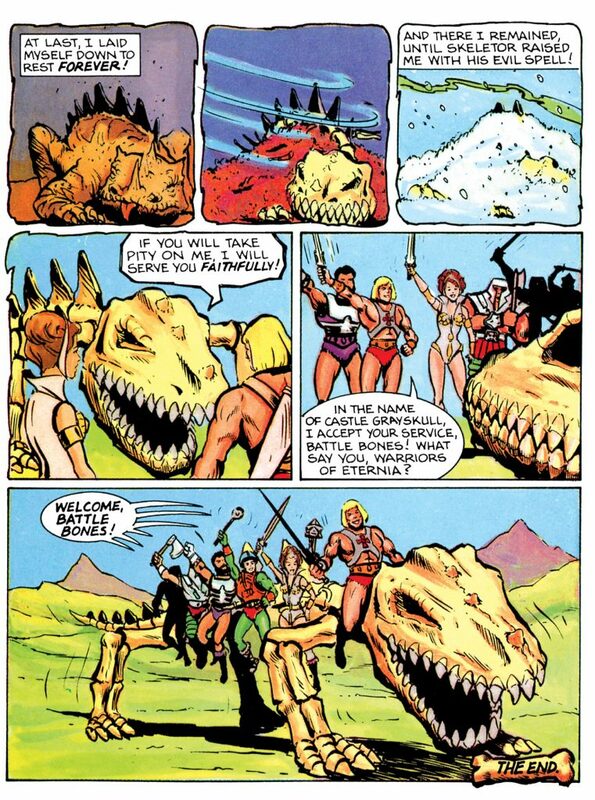 In this story, there are multiple Tyrantisauruses. 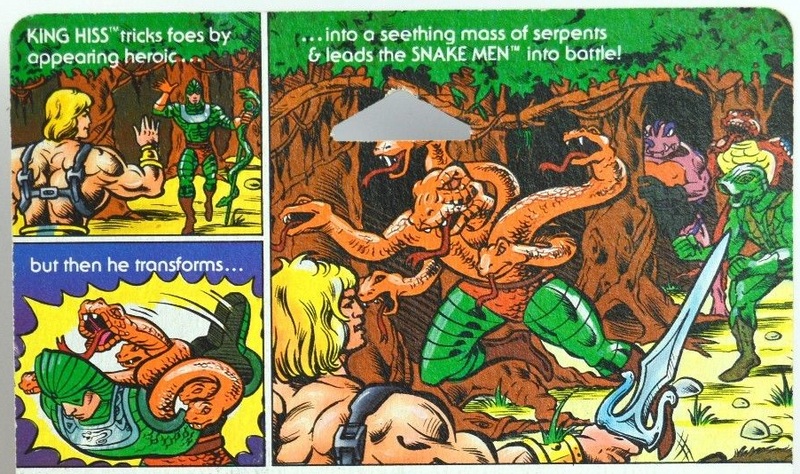 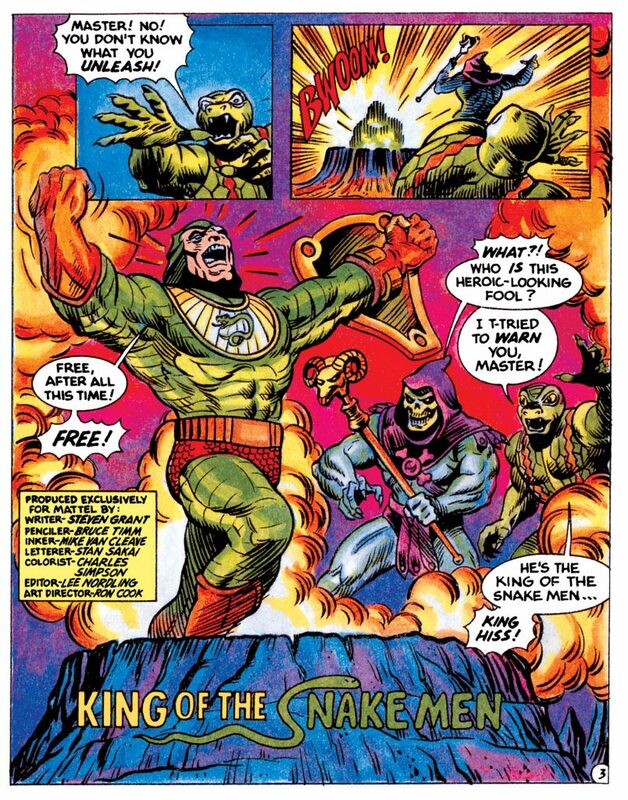 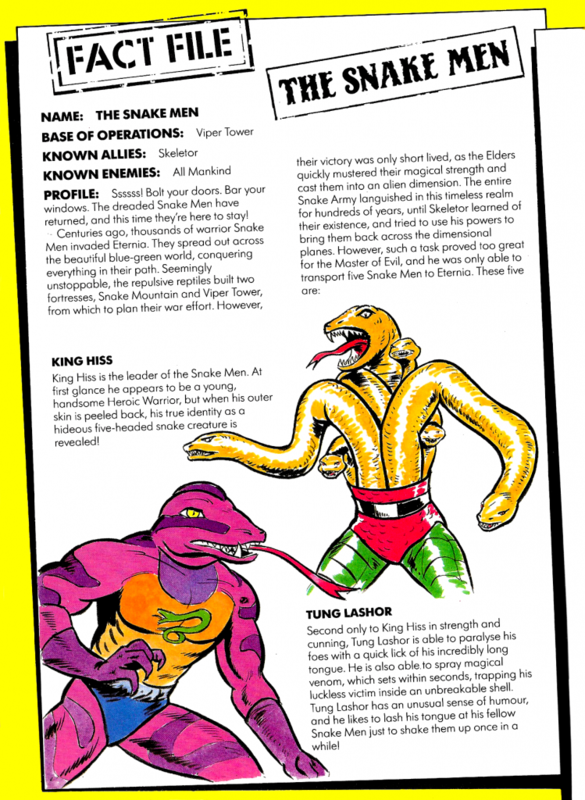 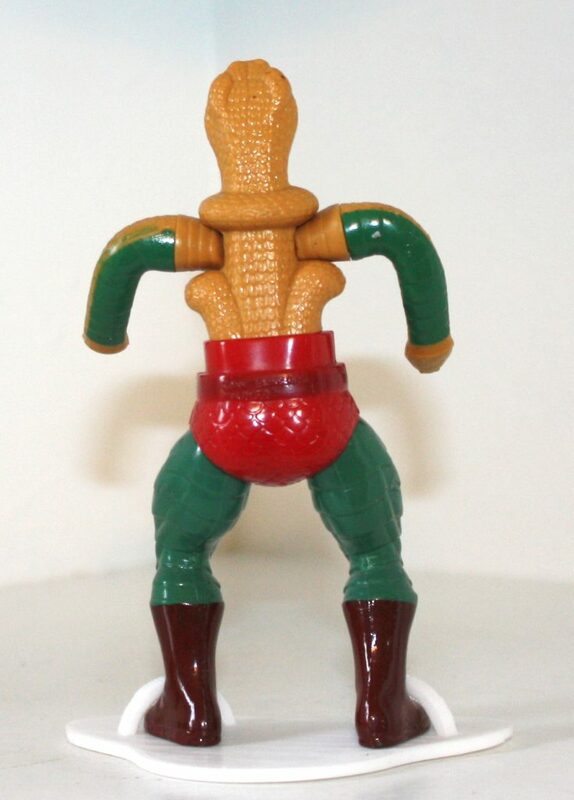 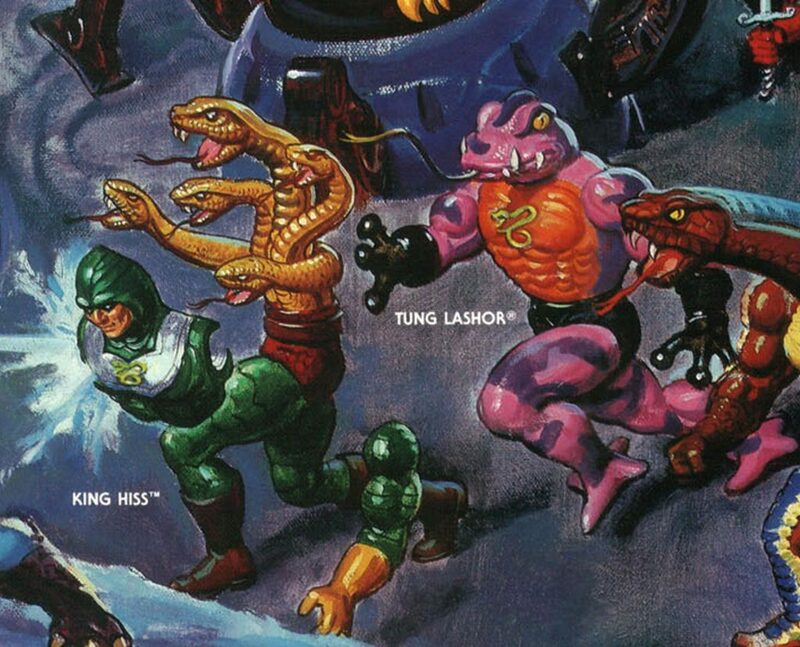 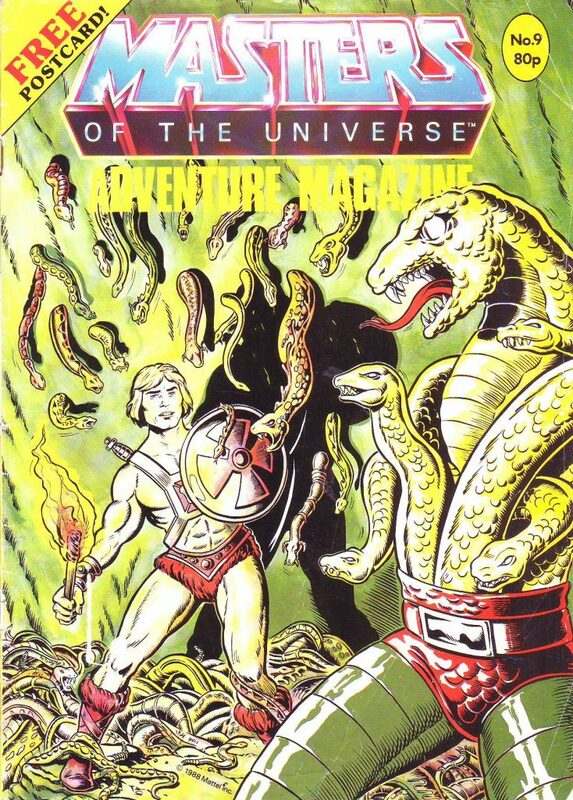 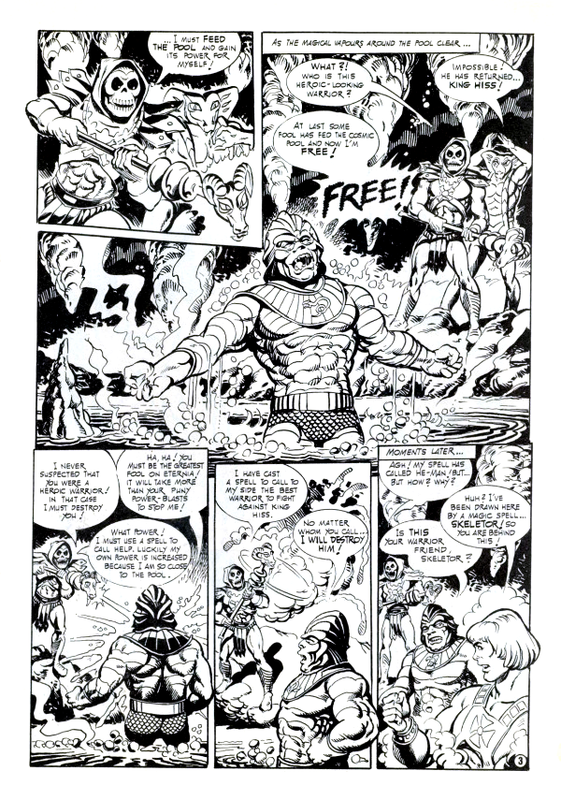 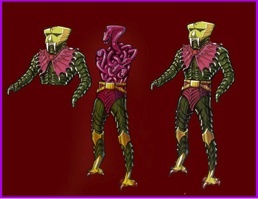 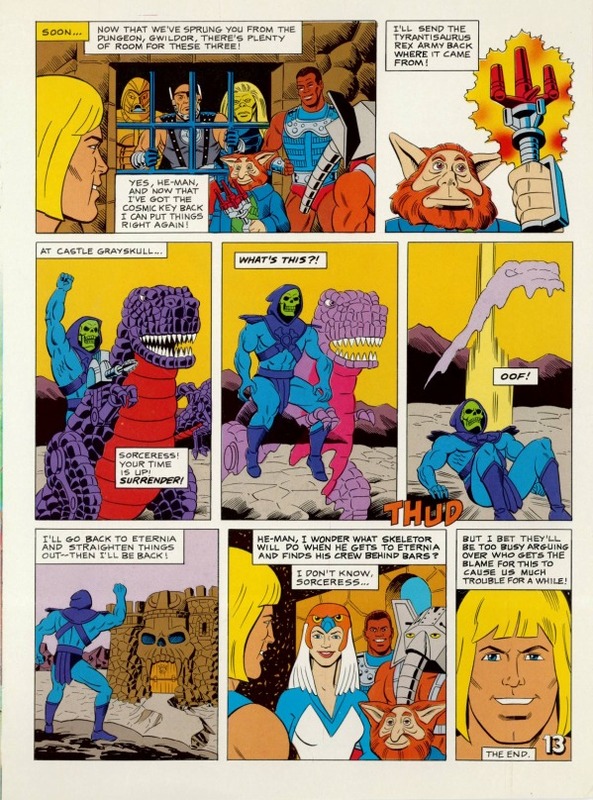 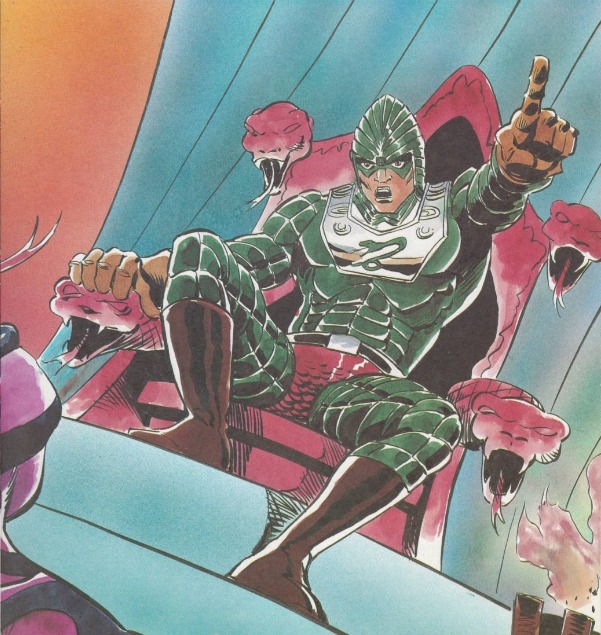 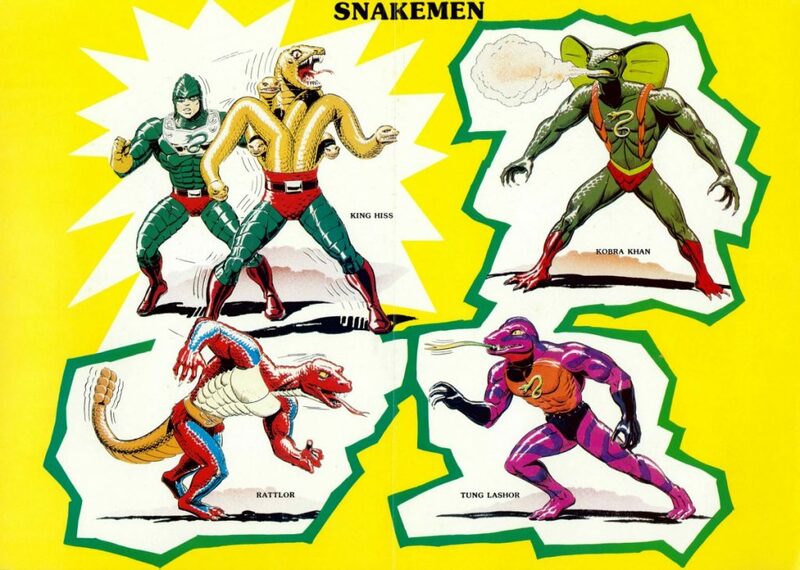 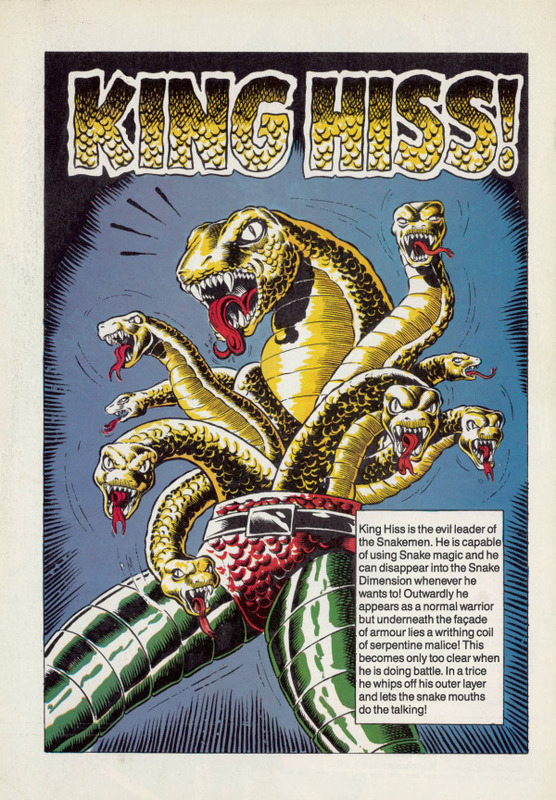 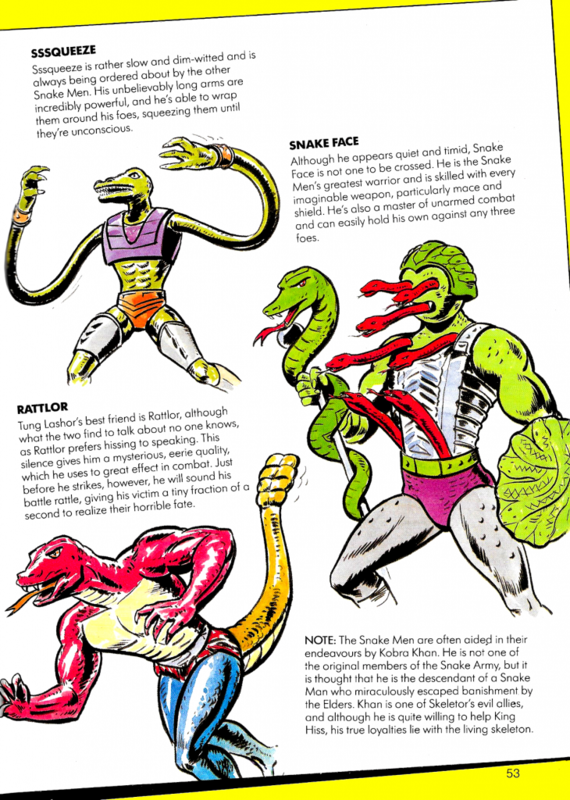 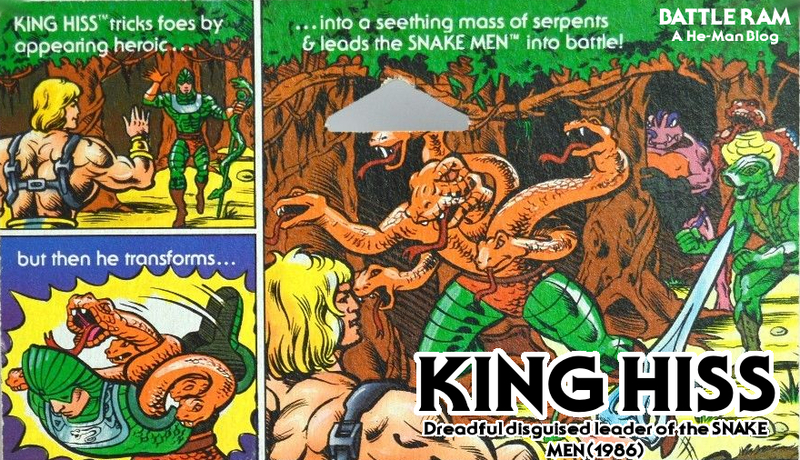 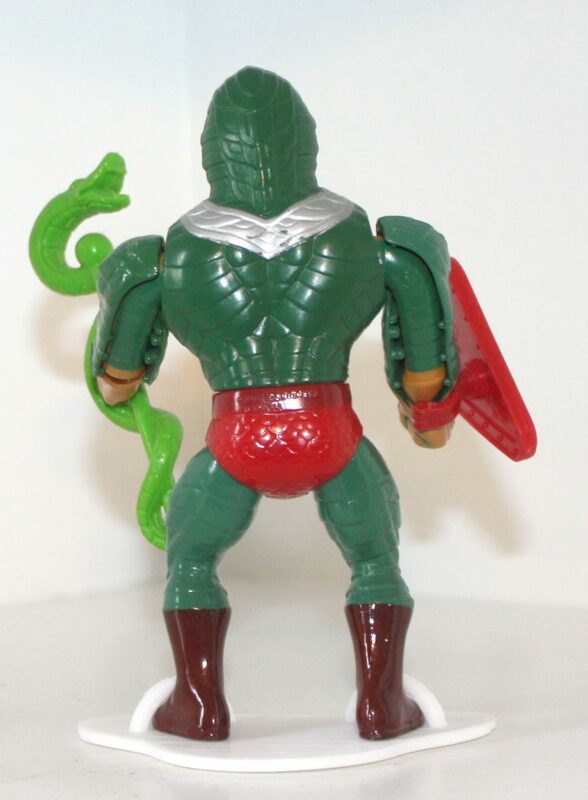 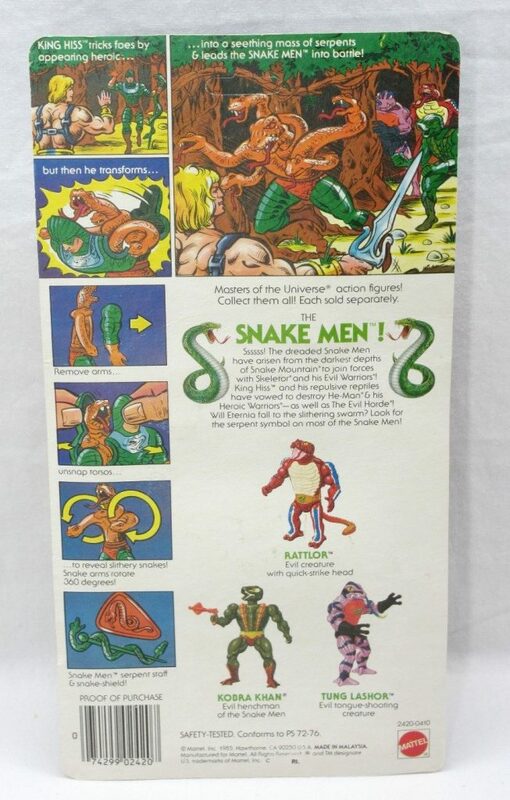 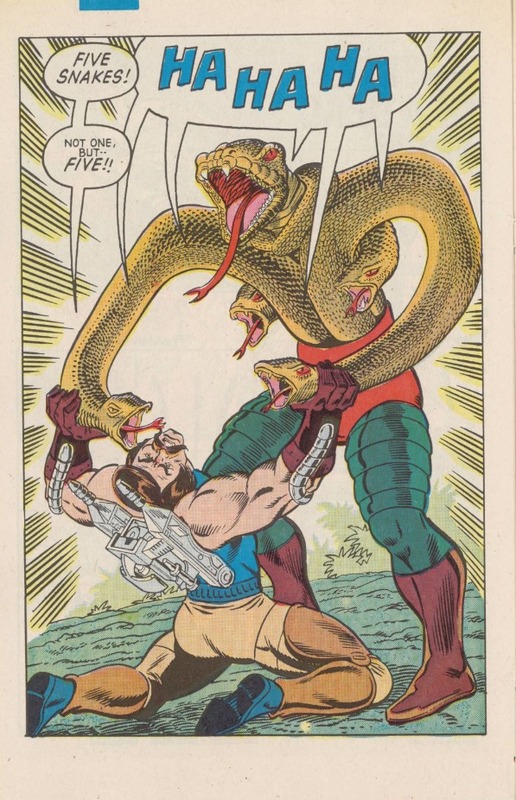 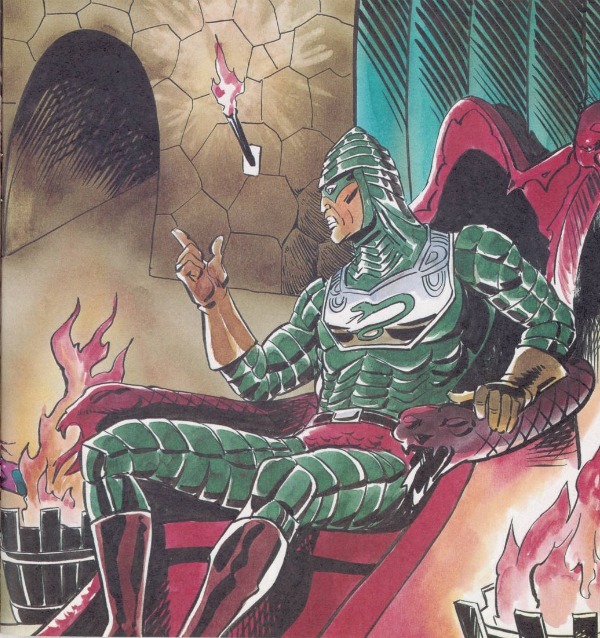 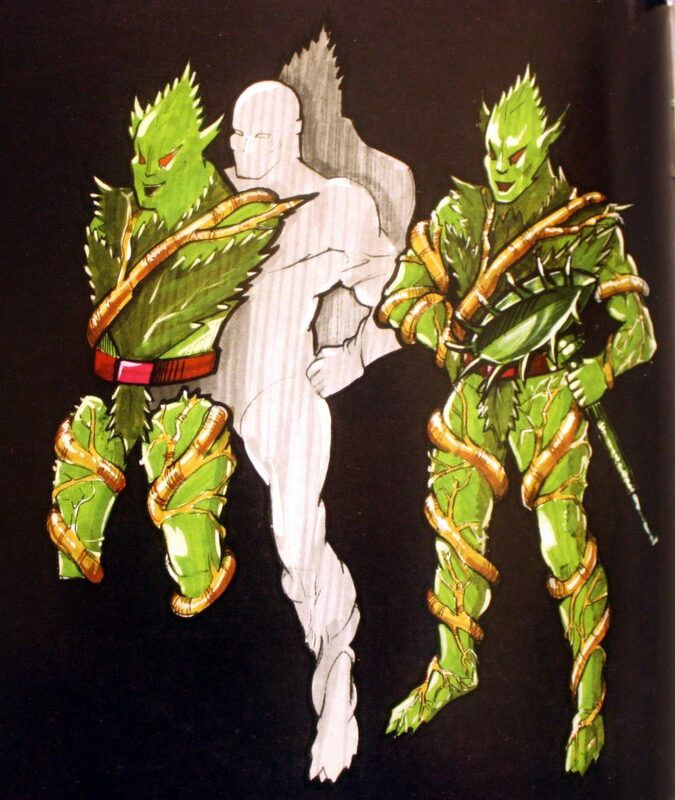 The creature is also green in issue 3 of the 1987 UK MOTU comic series, again with a green color scheme. 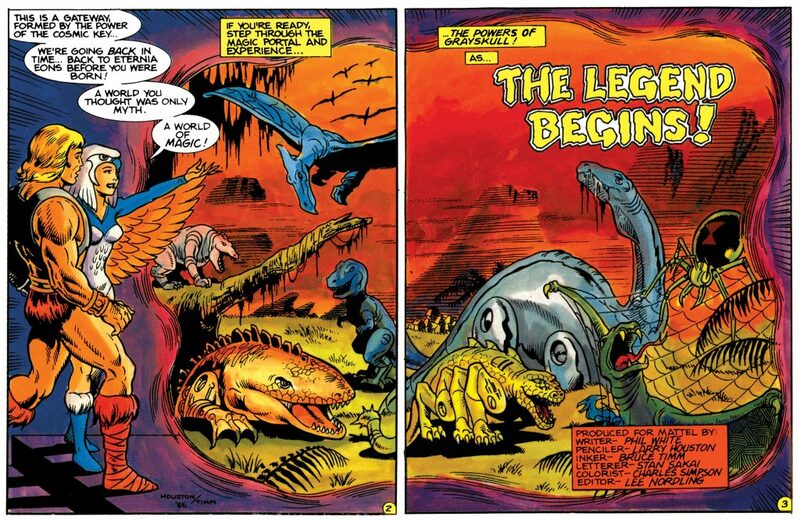 In the story, Tung Lashor refers to it as a “Warsaur”, which might be an early working name for the creature (thanks to Petteri H. for the tip). 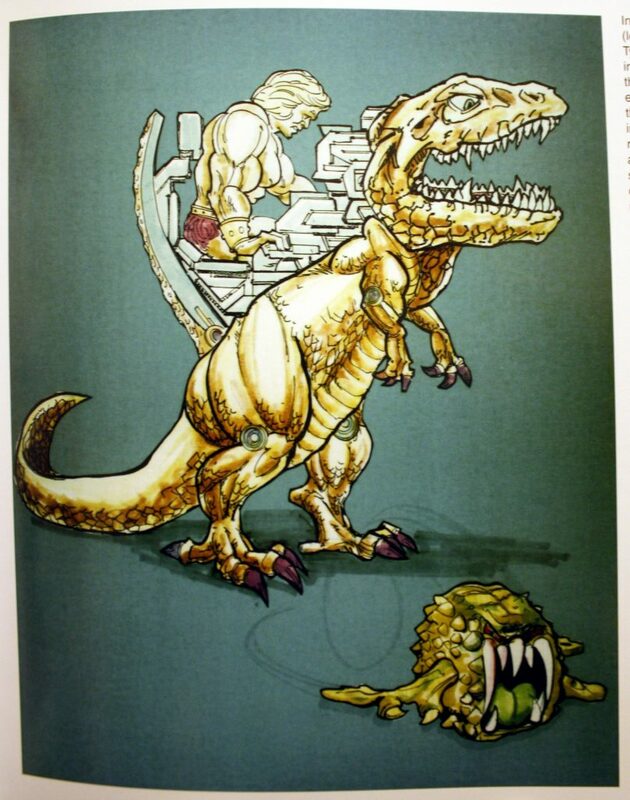 Tyrantisaurus is one of the cooler looking beasts of tail end of the line. 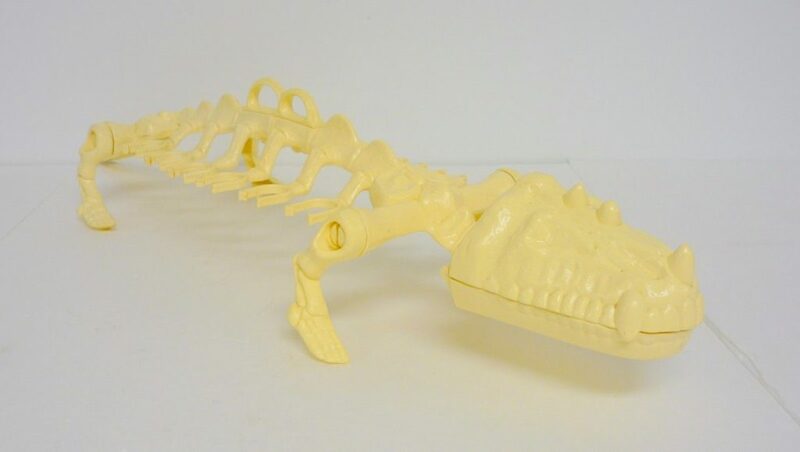 Because he was produced in limited quantities, he’s quite pricey these days, but a must-have for any aspiring Preternia collector.